Great visit with recent guests! We had been anticipating our upcoming guests, Chuck and Terry. Chuck is Luther’s cousin and Terry is his wife. They live in Knoxville. I had only met Chuck once or twice and very long ago. We had a superb time with them. It is always a pleasure to have guests who so obviously enjoy everything we show them and are always up for anything. 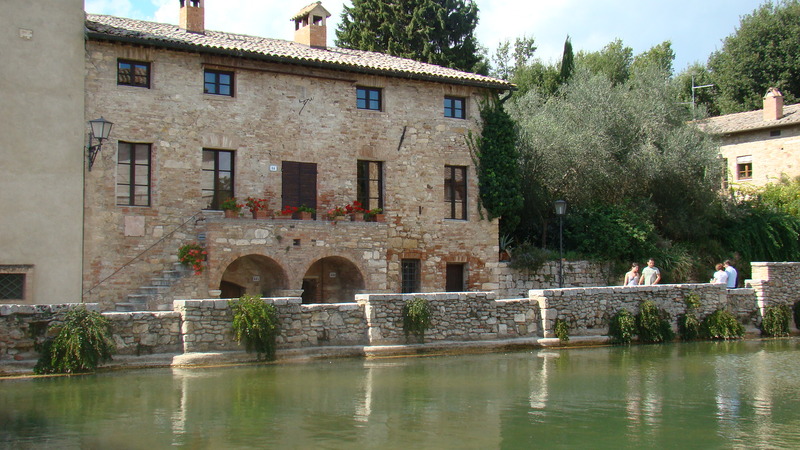 We went to Montone the evening they arrived for a dinner at Antica Osteria. It was good as always. 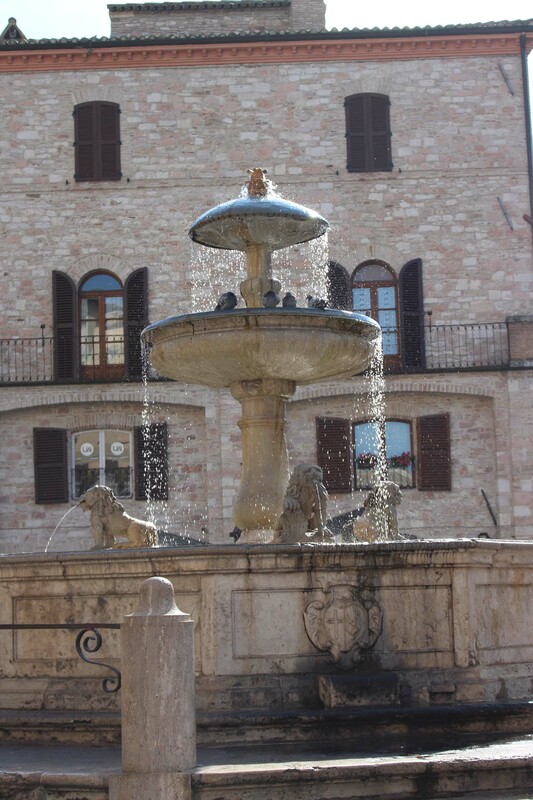 The next day we had planned to go to Assisi which is always the top site to see in Umbria. Terry bought a pretty purse at Michaelangelo Leather shop right in the main piazza. I also was interested to look at the briefcases they had which were quite plentiful. I have a friend coming soon who will be looking for this item. The day was amazing. The mornings in Umbertide are always very foggy starting in about September. It is like clockwork every year! It burns off in an hour or so. The sky was brilliant blue. 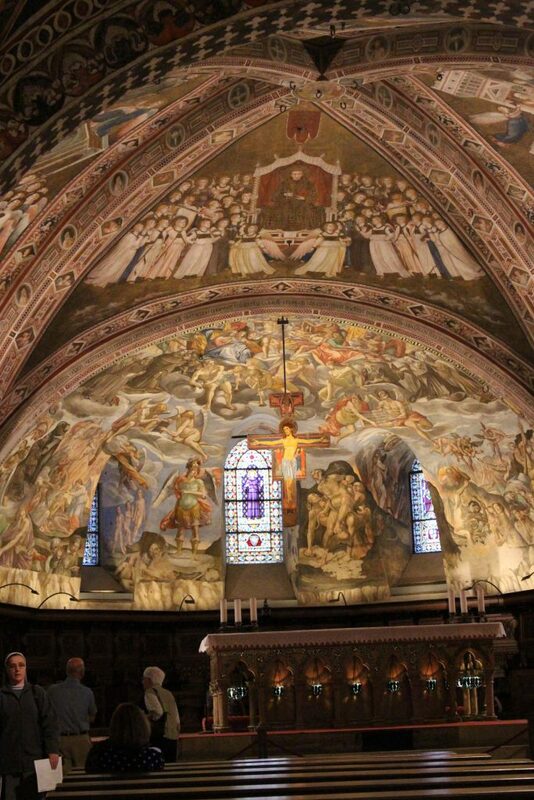 Here are some Assisi pictures. 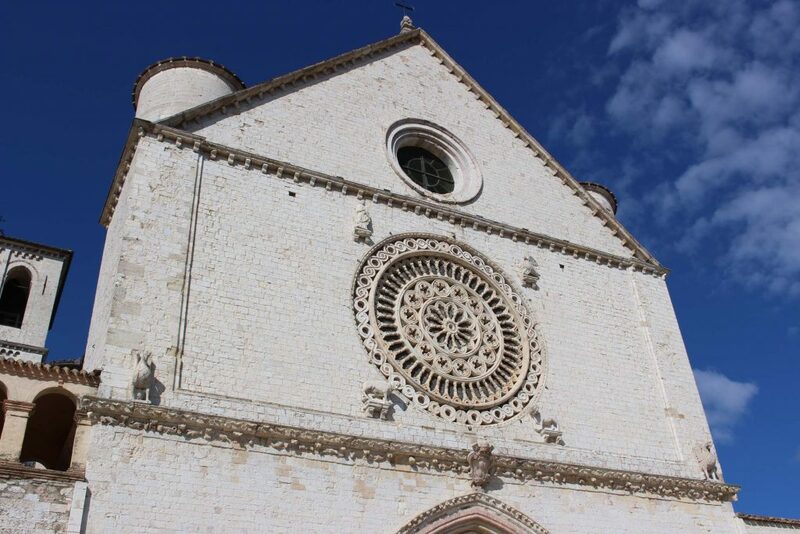 The Rose Window on the Basilica of San Francesco. 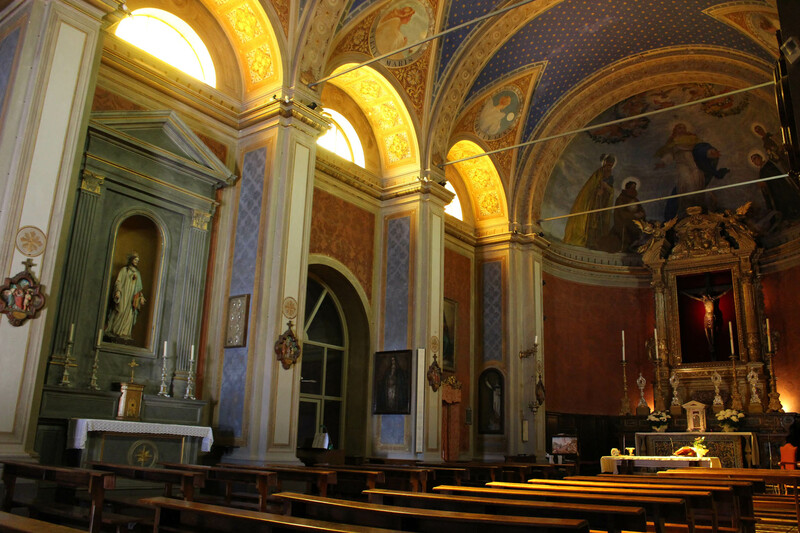 The lower church in the Basilica. It is made up of the upper church, built on top of the older, lower church, which is above the crypt where St. Francis’ remains are interred. Street. I like the blur in the background on this one. 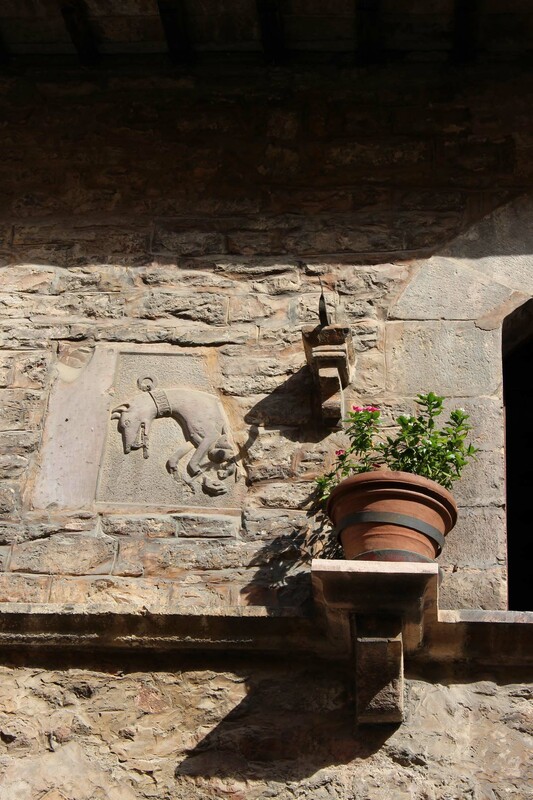 I was captivated by the dog who looked to be chained beside this window on the first floor. 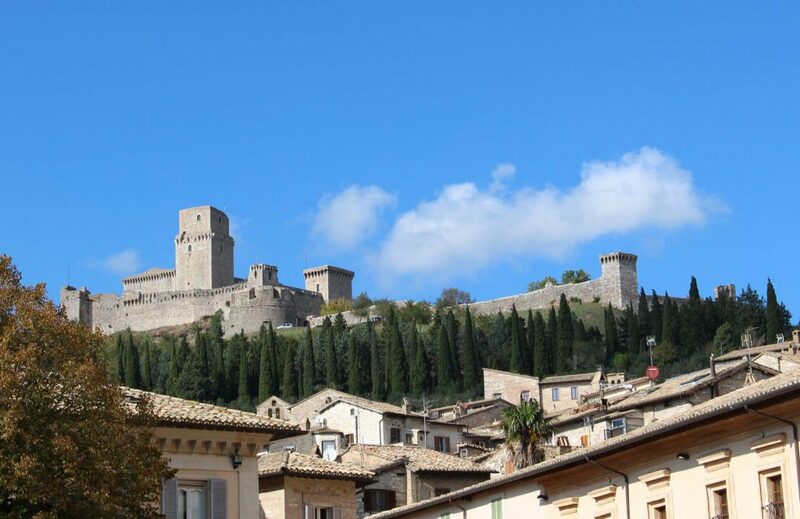 Fortress above Assisi. See that sky!? In the main Piazza is this fountain. The water droplets were shining in the sun. I had never noticed the top tier on this is a mushroom. 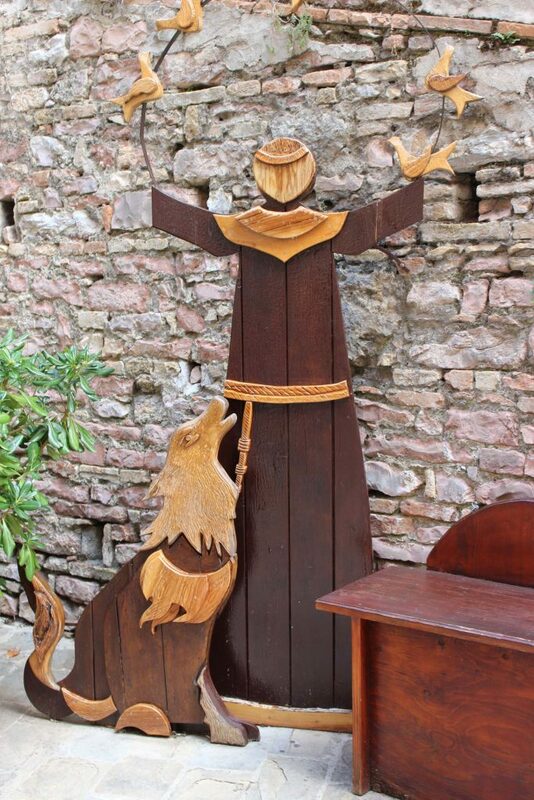 One of my favorite stories is about St. Francis and the Wolf. The legend took place in Gubbio. St. Francis also is known for preaching to the birds. After all that sightseeing we took a break for lunch. We ate at Piazetta dell’Erbe as we almost always do. My favorite restaurant there. 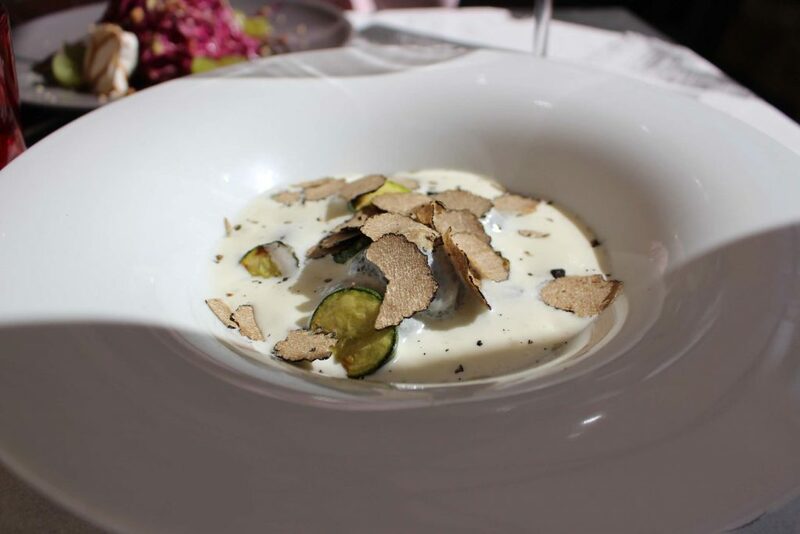 I had the octopus and the black gnocci with truffles and parmesan cream. After lunch we visited Deruta where Chuck and Terry bought a beautiful bowl for her table. I hope they got it home safe and sound. On Wednesday we were expecting the Stufa serviceman so we had to stick close. But then, it is market day with plenty to do right in town. I introduced Chuck and Terry to the Porchetta Panini. Makes a decent breakfast. We wandered the stalls and afterward we went to Patrick’s Enoteca for lunch. That evening we had my World Famous Bolognese sauce on Strangozzi. 🙂 Everyone seemed to like it. Thursday we thought we’d go wine tasting. It was overcast and showered on and off but not too bad. 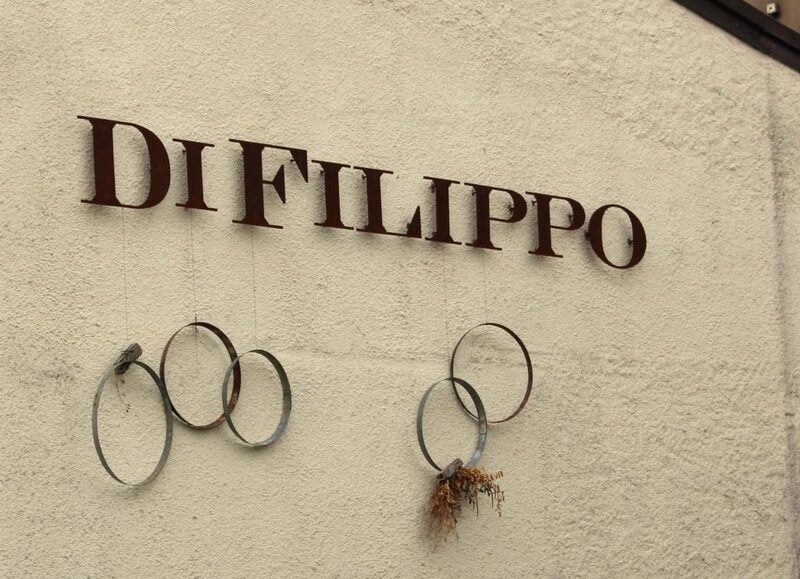 First we visited DeFilippo Winery. They are Bio-dynamic and use natural pest control…geese! and horses to plow. 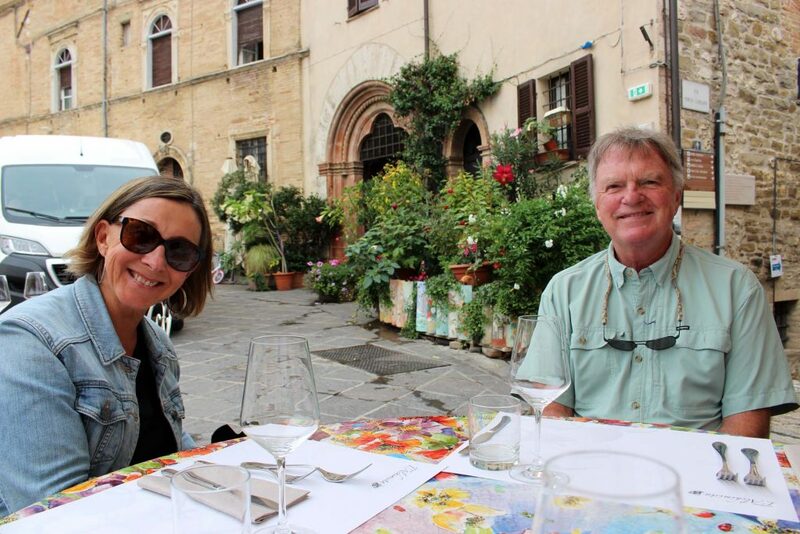 We had time for one more winery and ended up at Pardi in Montefalco. This winery, where we’ve been once before, is owned by a pair of brothers. They are trying interesting things with wine. Next was…what else? Lunch! We had a reservation at L’Alchimista in Montefalco. We did sit outside despite the sprinkles which we had to shift a couple of times to avoid under the Umbrella. The visit passed too fast but we did get in three full days with them and we hope they come back to visit us soon. They are always welcome. 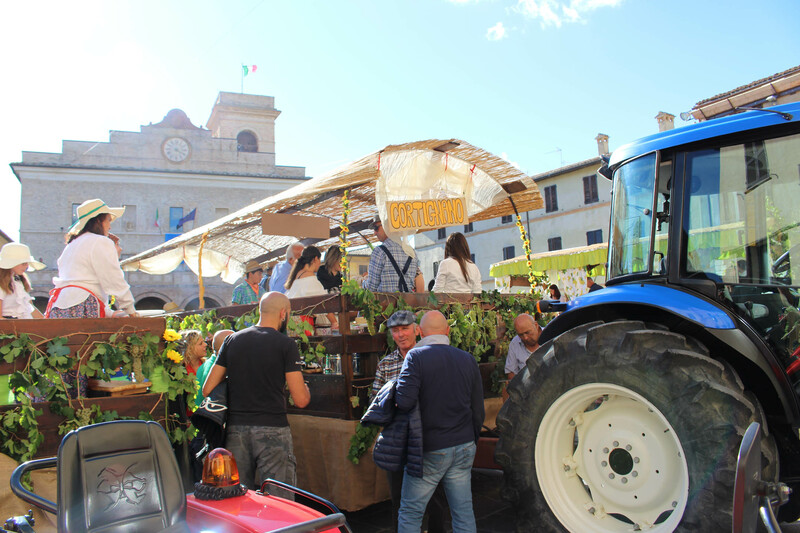 This entry was posted in cooking, Eating, everyday life in Umbria, Guests, Italian life, restaurants, shopping, Umbertide, Umbria, Visitors, Wine and wineries on October 17, 2018 by Nancy Hampton. 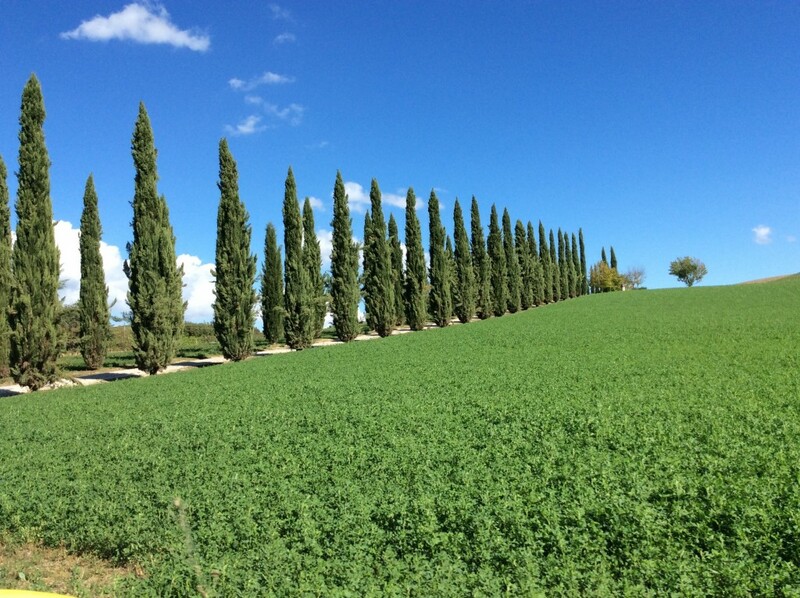 The last week we have gotten out and about enjoying the beauty that is Umbria. And the bountiful restaurants. Poppies are blooming everywhere. 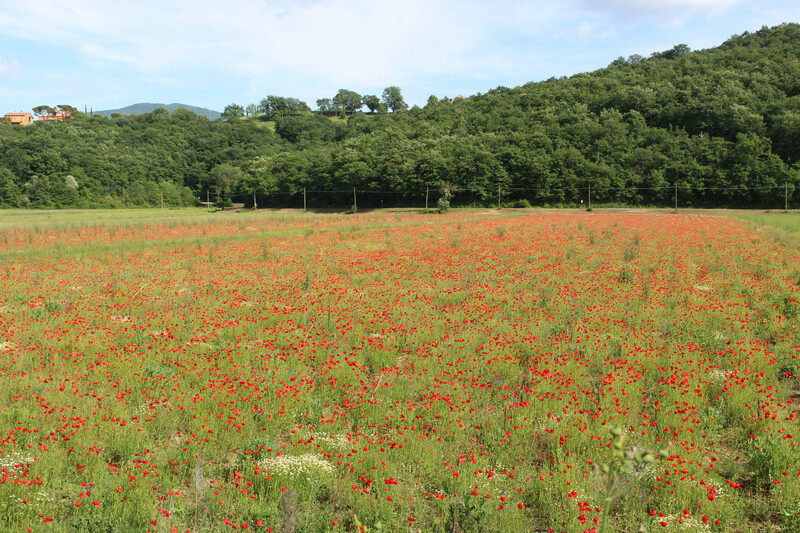 Here was a whole field of them near the Tuscan border. We went back with some friends to one our favorite places near Magione, a town close to Lago Trasimeno. 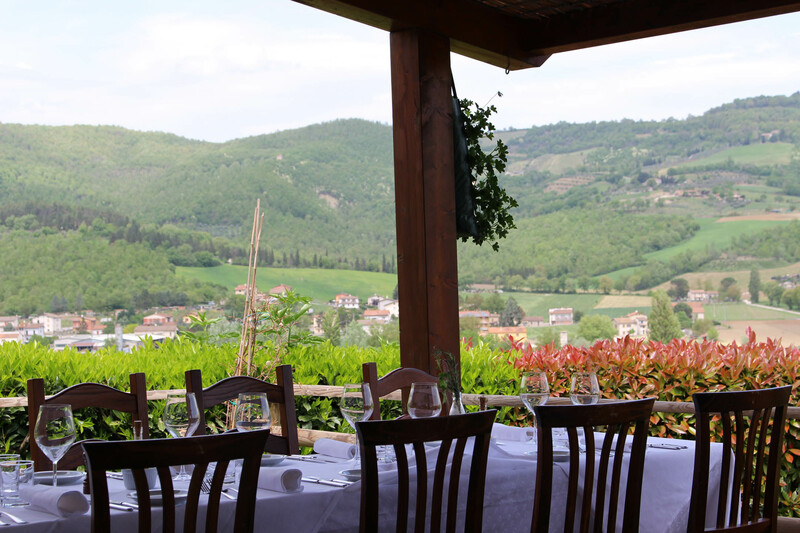 The restaurant is Umbricello del Coccio. 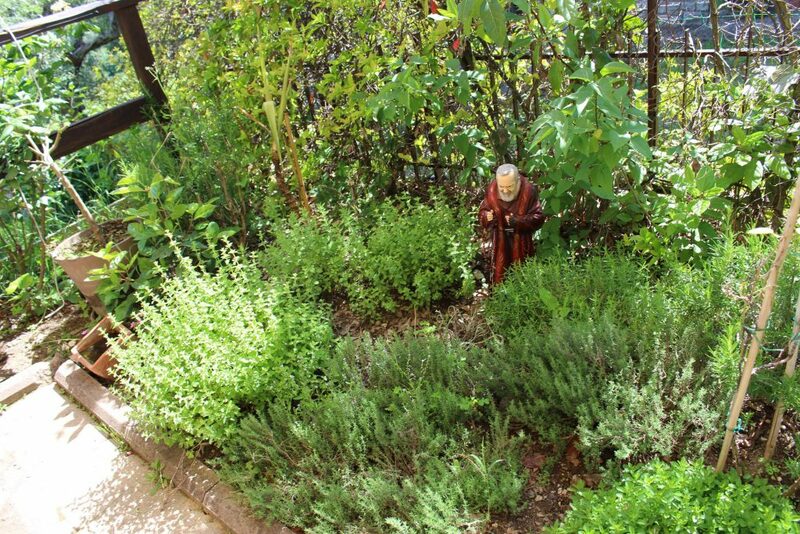 They have a really pretty herb garden next to the terrace with a cute priest presiding. This is on a pilgrim route so there is a church next door – Santuario della Madonna di Lourdes. Inside there is an identical cave, or grotto, to the one in France. Brilliant sunshine splashed across the church. Lunch was Umbricelli caccio e pepe. An assortment of legumes for which Umbria and Toscana are famous. 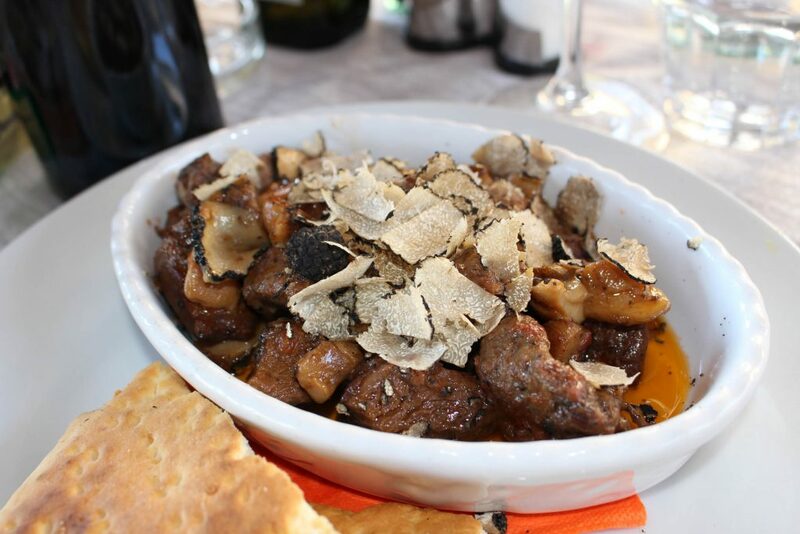 Cinghiale (wild boar) stew with black truffles. Yesterday we were off on an excursion to a winery. Sometimes these places are hard to find. And they are EVEN harder when your husband gives you the wrong name!! We visited Tenimenti d’Alessandro. Luther had made an appointment for a tasting. it was a large estate with vacation apartments, facilities for conferences, a restaurant, olive groves and vineyards. This vintner was bucking tradition and had planted Syrah and Vigionier. Normal Tuscan grapes are San Giovese and Vermentino. We met up with Laura who was a nice young woman who had recently moved from Rome to be with her fiance. He is the chef at the restaurant on the estate. She took us on a tour of the facilities. Pretty normal except for a couple of “experimental” containers for some of their wines. They were unique to us. This one is terra cotta. And this one was ceramic. We settled in for our tasting. We could each pick four. We chose a white, rose, and two reds. Maybe the Wine Guy will do a column? Rose is called Red Pepper! 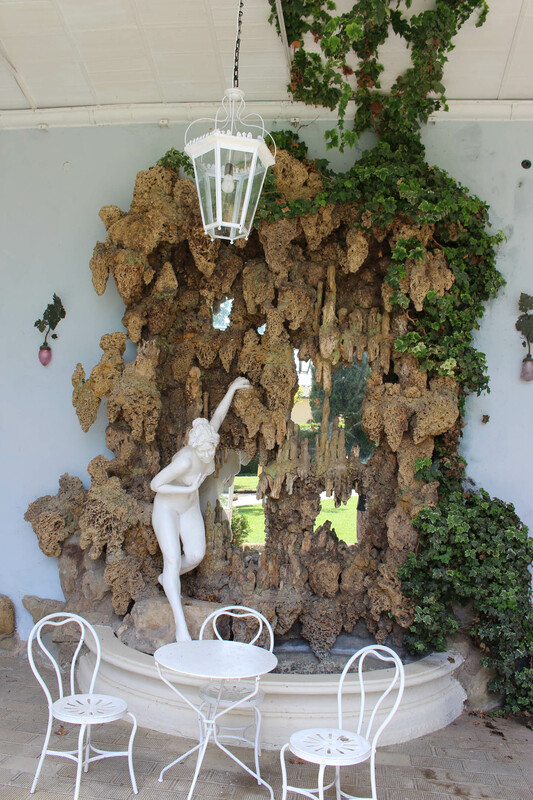 The property was on volcanic soil and they had used the lava in interesting ways. One was as a kind of rock garden along the walkway. This one was in the building housing the restaurant. It was comfortable, attractive and unpretentious. Ricotta salad with cabbage. It was yummy. Luther had beef with cabbage. 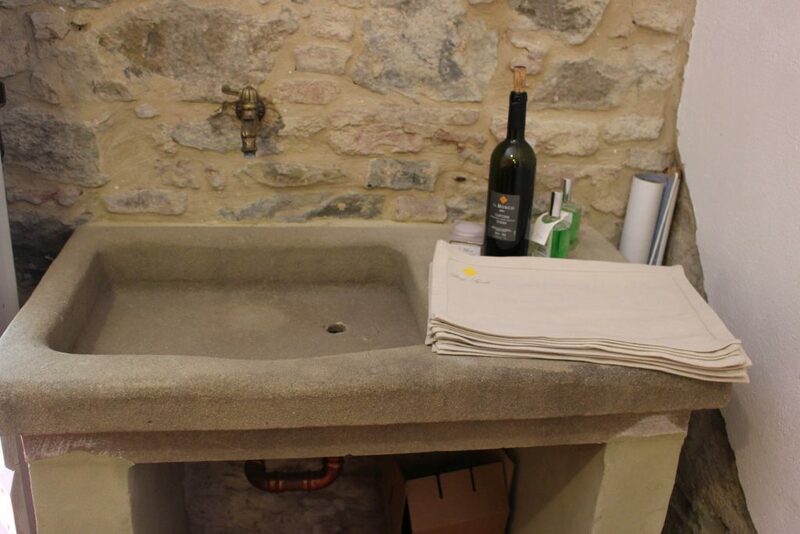 I loved this old farmhouse sink . Wish I could have one! 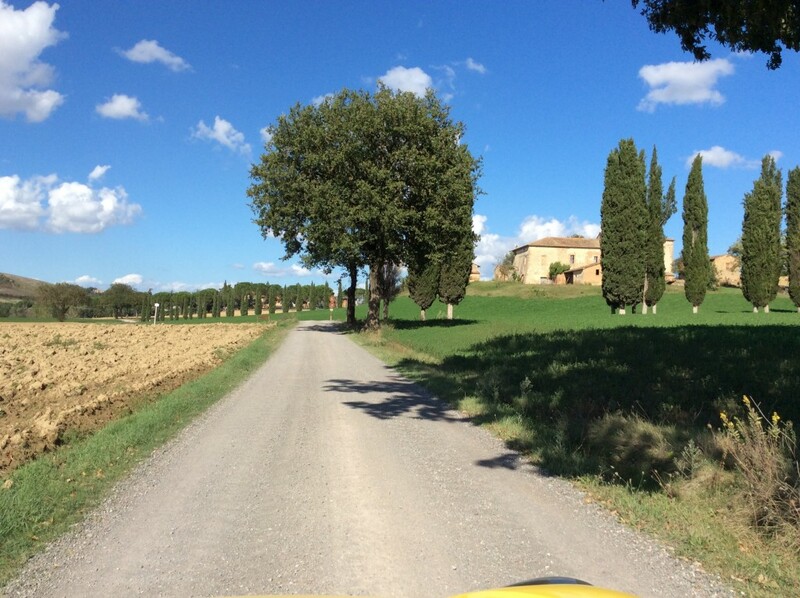 It was a fine outing in Tuscany and the weather is now ab-sol-utely perfetto!!! This entry was posted in Eating, restaurants, Uncategorized, Wine and wineries on June 1, 2018 by Nancy Hampton. Saturday we visited the Only Wine Fest in Citta di Castello. It was a nice day and we got there at 2pm when they opened to beat the crowds. I took a seat and watched the comings and goings focusing on fashion rather than wine. Tickets sold here. 15 Euro for 5 tastes and a glass. I was kind of amazed that they laid white carpeting on the old stone streets. I wonder what it looked like Sunday after the event. The fest focus’ on wine produced by young unknown winemakers under 40 years old. This is one of them. I liked his unstudied look. Lots of Italian guys wear their hair in pony tails. This young lady obviously knew she has what it takes to catch attention. Calagrana welcomes Spring! The Patio is OPEN! I had the duck. It was delicious. The duck came with little dumplings and some cool condiments. A great day to welcome spring. Thanks Ely and Albi! 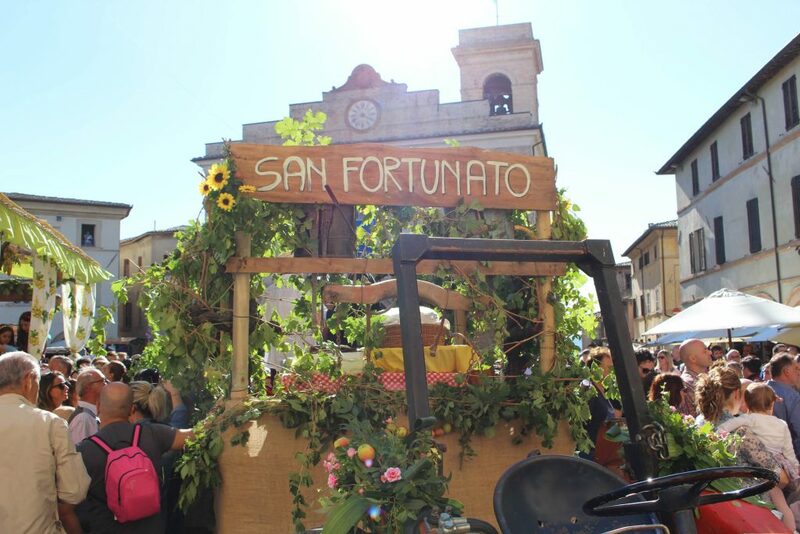 This entry was posted in Eating, everyday life in Umbria, Festivals and Sagras, Italian life, Wine and wineries on April 30, 2018 by Nancy Hampton. Another guest post from The Wine Guy. Leaving our hotel on a gorgeous early fall morning, we head south on the A1/E80 following the old Roman road to Rome, crossing the flatlands around the provincial capital of Grosetto, and entering the rolling hill country of the Monti dell’Uccelina. From there we branch inland into the rugged wine region around the mountain town of Scansano. 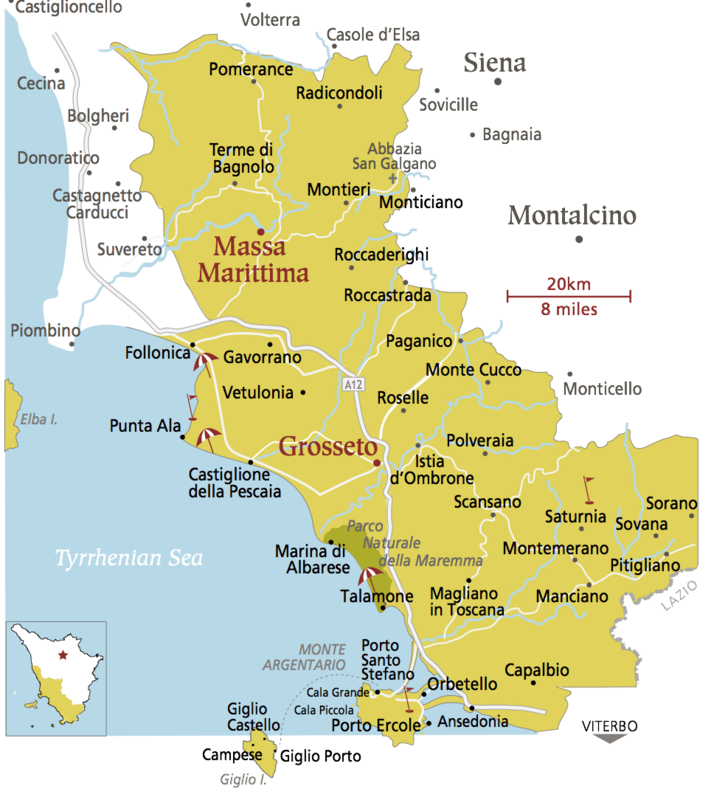 The region around Scansano takes its name from a varietal of the Sangiovese called Morellino. One of the more romantic theories around the name is that it comes from “morello”, which literally means “brown”, the color of the region’s horses. More down to earth observers suspect it derives from the morello cherry, a dark red cherry known for its acidity and tartness. 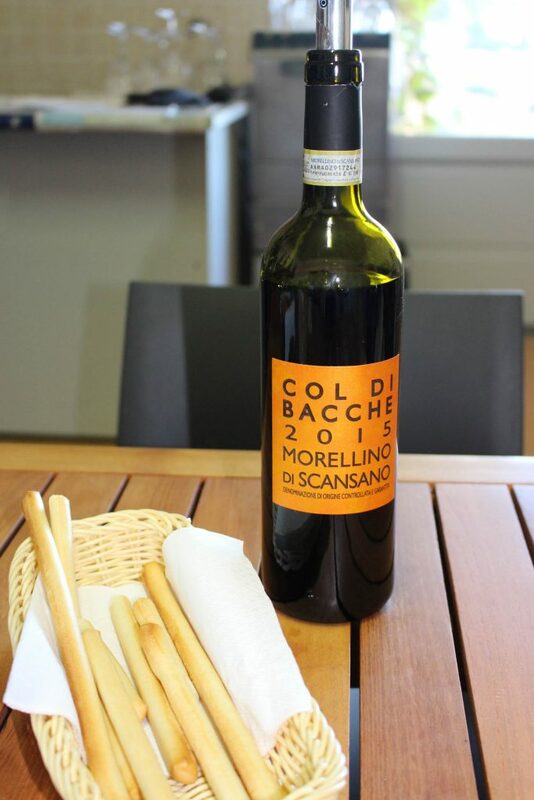 In any case, the local Sangovese has been granted the highly prized DOCG status since 2007 as Morellino di Scansano. 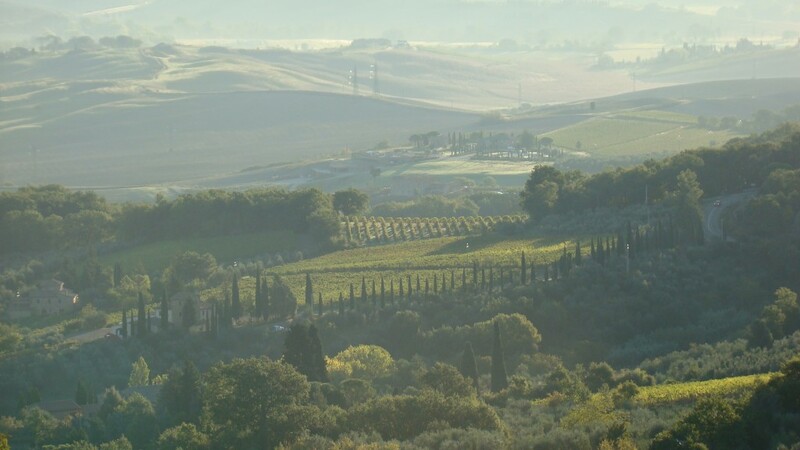 A Morellino di Scansano must consist of at least 85% local Morellino, with up to 15% coming from a list of other permitted varietals maintained by the Tuscan wine authorities. This makes it essentially a local version of the wines of Chianti. Morellino can come in two subtypes, the Morellino di Scansano, which does not require any oak aging and is primarily a light, crisp everyday drinking wine, and the Morellino di Scansano Riserva, which must be held for two years after the harvest, with at least one of these years in oak, a much heavier wine with considerable aging potential. Our first goal in the region is Col di Bacche, just outside Montiano in the high hills around Montiano. This relatively new property of 13.5 hectares rises above the surrounding hills and offers a splendid view of the bright blue Mediterrenean in the distance. It was first planted in 1998 with the first release appearing in 2004. It has rapidly advanced, becoming one of the premiere wineries in the area. We are greeted by Cosimo Carnasciale, son of the founder. Before trying the wines, we talked a bit about the intense heat and drought and its probable effect on the vintage. Cosimo was very upbeat, explaining to us that the area around Scansano is considered the hottest part of Tuscany, and that the weather there had been hot, but not drastically so by local standards. 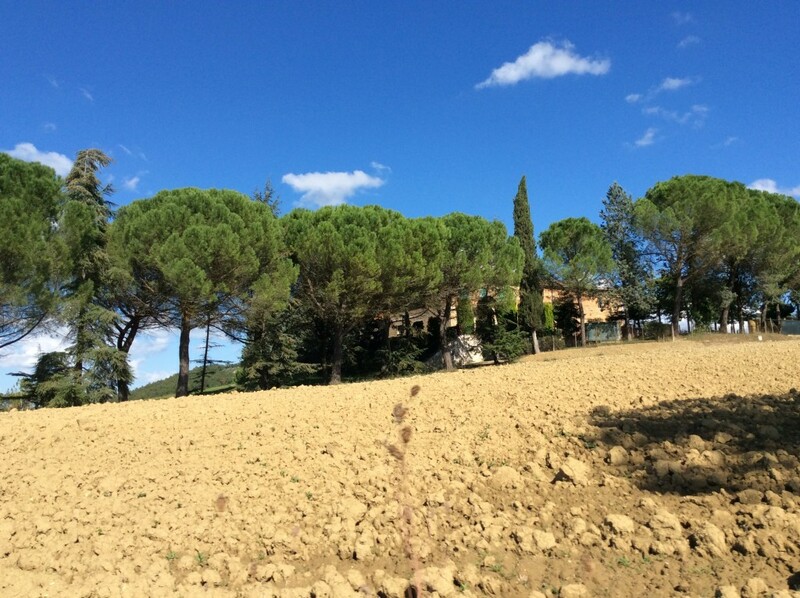 He’s expecting lower yields, but the quality is high and there has been no signs of diseases, which seem to worry Tuscan winemakers considerably more than the weather. 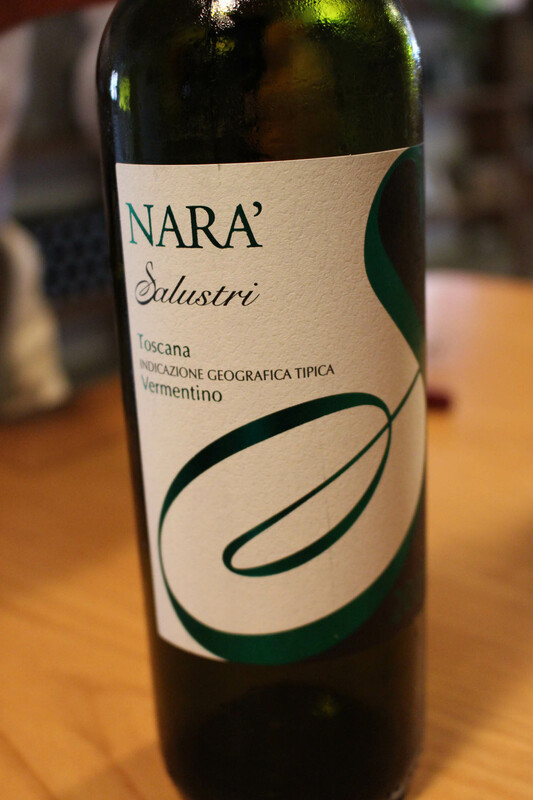 We began with the Vermentino, which was an interesting contrast to the Narà which we had tried the day before. Here, the nose was decidely fruity and florid, with very pleasant acidity that did not overpower but promised a good pairing with fish, antipasti and milder salamis. We followed this with the 2015 Morellino di Scansano, the lighter of the two Morellinos produced here. It’s a ruby red wine meant for relatively early drinking, although it has some aging potential with 40% seeing five months in old French oak while the majority undergoes clarification is stainless steel tanks. This yields a well-structured fruity wine with soft tannins and notes of vanilla and strawberries. It’s lovely now. 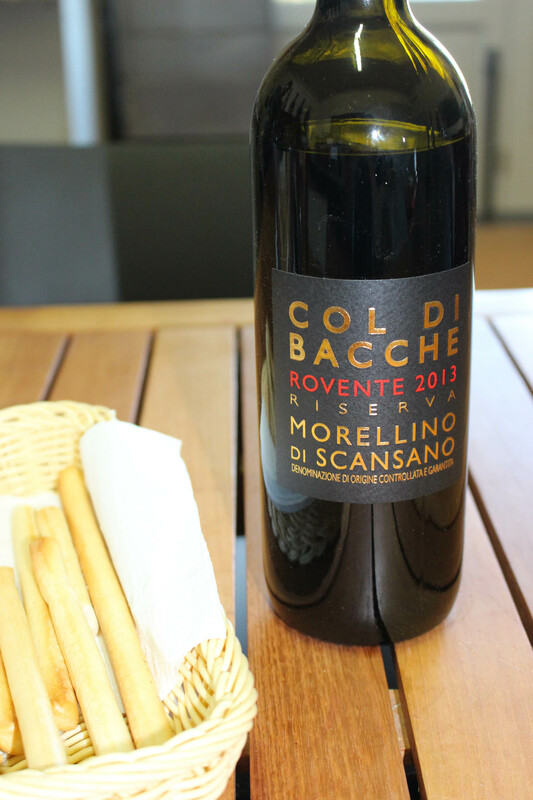 We next turned our attention to the Morellino di Scansano Riserva Rovente Riserva 2013. The flagship. This wine is made from a hand selection of the best grapes with a maceration 18 to 21 days to express the full potential of the harvest and aging in new French oak for 12 months. 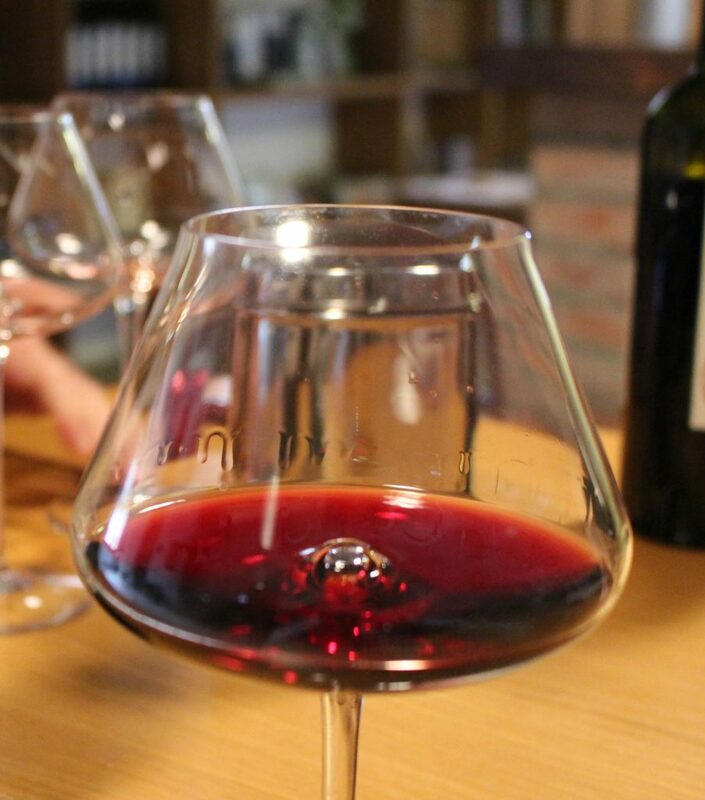 “Rovente” is Italian for “fiery” or “passionate”, and the wine expresses these sentiments well, with a warm, round nose, mouth-filling, spicy body and a full finish. This wine is built to go the distance, and should reward 10 years or so of aging. 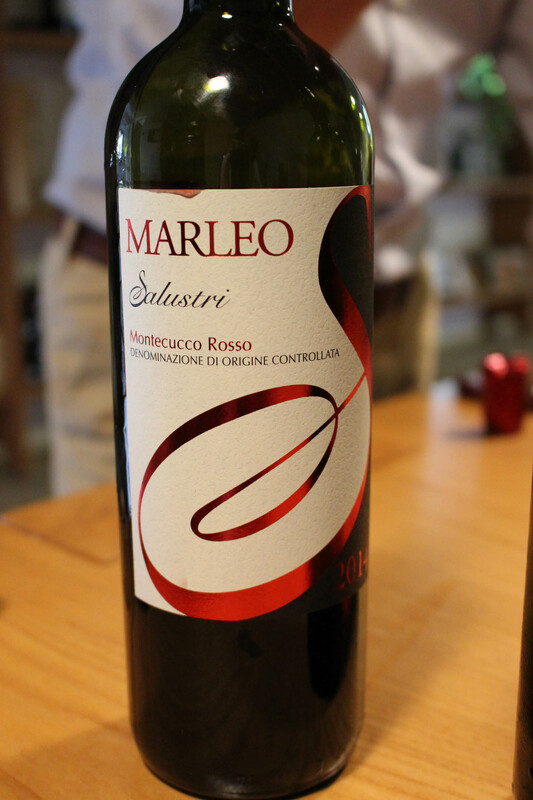 It is considered one of the best Morellino di Scansano by many of Italy’s leading wine journals. Factoid: Cosimo remarked that in the future, the wine will be labelled solely Morellino di Scansano Riserva, dropping the word “rovente”, which can also mean “sizzling” or “scorching”. He says the winery has decided this is a bit over the top now that the vineyard has found its place among the top producers. 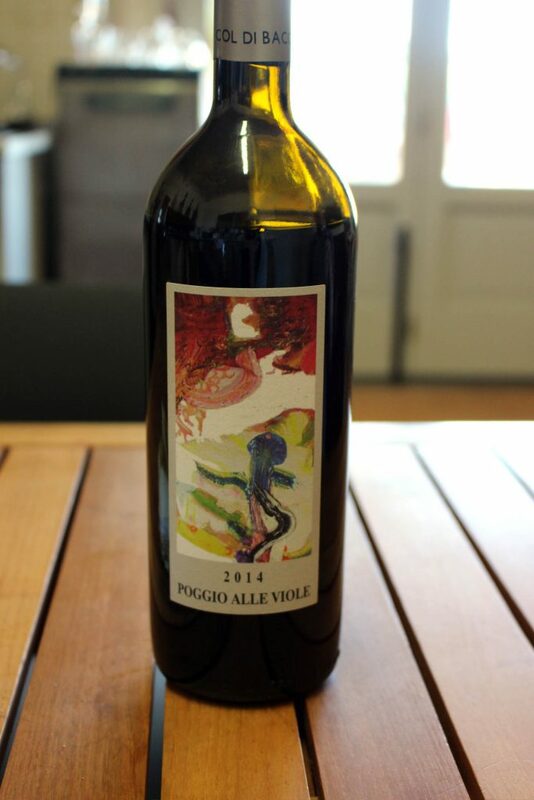 As his final offering, Cosimo brought out his pièce de résistance, the 2014 Poggio alle Viole (Hill of Violets), his version of a Brunello di Montalcino. It is 100% hand selected Sangiovese, as is Brunello from what he considers his best parcel and sees 15 months of aging in small oak barrels. 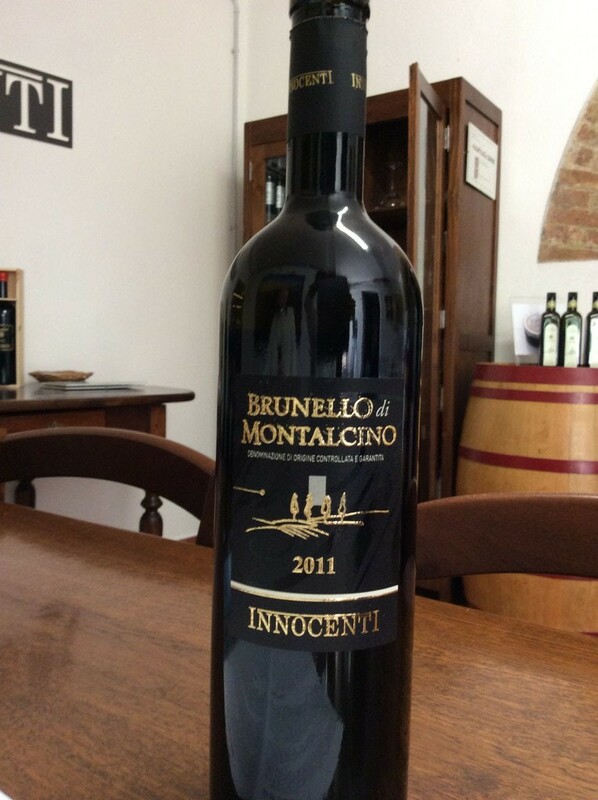 (Brunello actually requires 36 months) Oddly enough, he is not allowed to put the DOCG of Morellino di Scansano on the label: although the DOCG requirements mandate that the wine should be mostly (85%) Sangiovese, it cannot be 100% Sangiovese. It’s an Italian thing–Go figure. In any case, the wine is lovely, but a bit young. Dark ruby red with a gingery nose with some peppery hints. Lot’s of body in the mouth and a deep finish. The tannins, not overpowering, but clearly present, hint at a wine that could improve for many years. Cosimo thinks it could go 20 years. This is clearly the masterpiece of the house and Nancy, who usually trusts that I will buy everything in the house, took no chances on this one, insisting we had to have some. This is high praise indeed. Leaving Col di Bacche heading south, we pass lovely hill town of Manciano in Toscana with its magnificent walls and medieval Fattoria della Campiglio, its stronghold. It’s a lovely day and we’d love to visit, but we want to get to Scansano for lunch and it looks like a bit of a drive. And so it is. The SS323 linking Scansano and Manciano winds it way up 500 meters through brush and pine forests with wonderful views towards the coast and into the mountainous region separating the Maremma from central Tuscany. The top is down and the weather is perfect. A lovely drive. 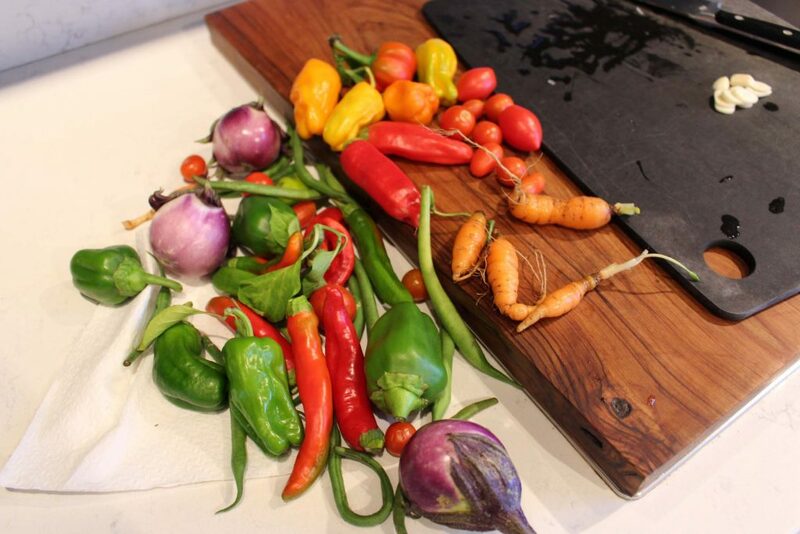 This entry was posted in Eating, The Wine Guy, Travel, Wine and wineries on October 19, 2017 by Nancy Hampton. 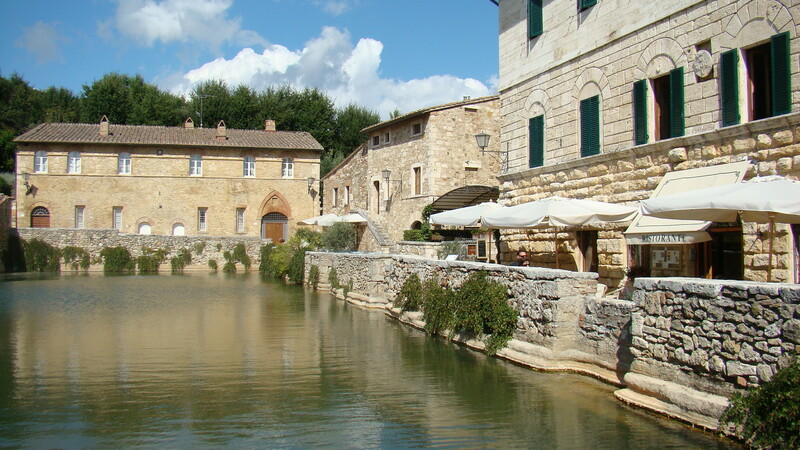 On this trip, we’re going to visit the southwest of Tuscany along the Mediterranean coast. Home to surprisingly good, and very reasonably priced, wines you might want to try to find. 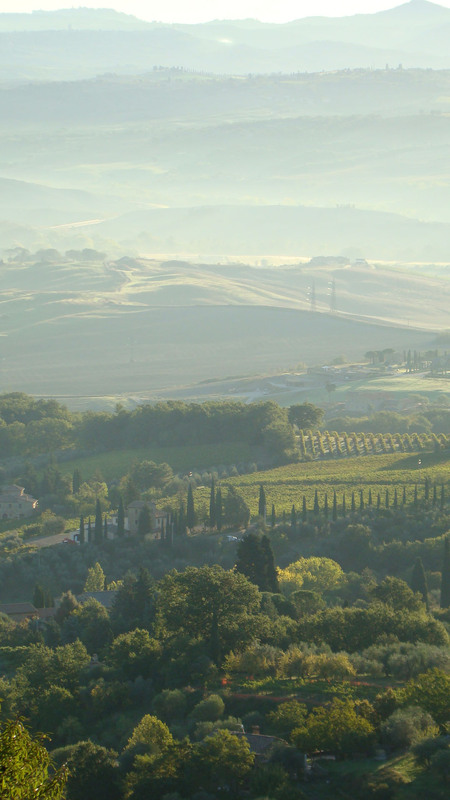 While we’re in the neighborhood, we’ll also look into what is probably the most prestigious (and correspondingly expensive) district in Tuscany, which you probably haven’t heard much about as the wines are usually locked away from prying little fingers. More on that later. Let’s start with our primary goal, the Maremma. We’re in the Porsche, so if I’m driving alone it’s probably about two-plus hours. However, Nancy’s along, so let’s call that two and a half. 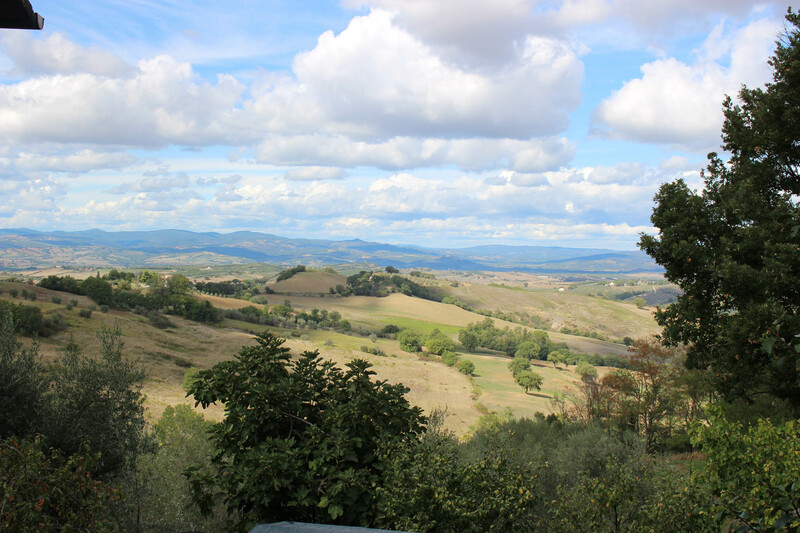 We drive west into the rolling hills of Tuscany as far as Sienna then swing south on the SS223 towards the principal city of the Maremma, Grosetto. We pass through some rugged, rocky hills that seem to form a natural barrier between this area and Chianti and finally emerge into the green rolling hills of our first target, the wine district of Montecucco clustered around the picturesque hill town of Cinigiano. 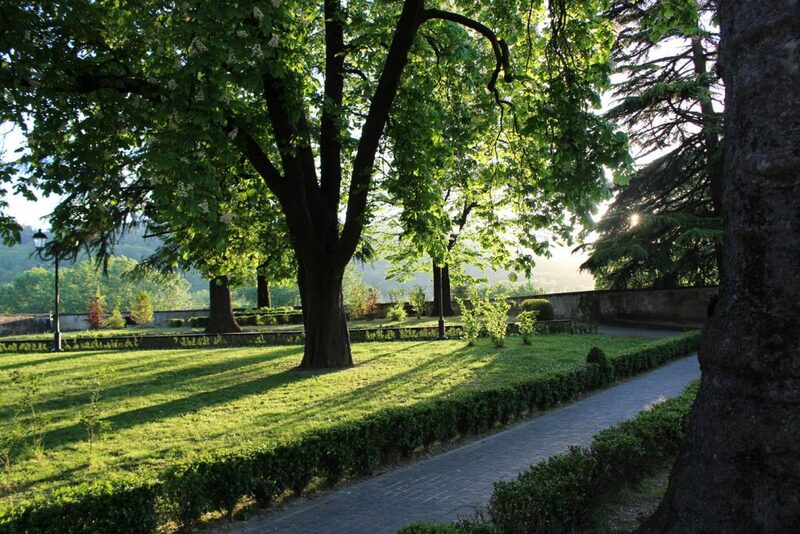 Our goal is the winery of Leonardo Salustri in the village of Poggi del Sasso, about five mile from Ciniziano. Although Poggi del Sasso is quite small, we had an interesting time finding the place due to the peculiarities of Italian signage, where signs facing the driver and pointing to the left can mean (1) go straight ahead down the road in front of you, (2) turn left here, or, (3) we’re just across the street. After a round trip through the village and several expeditions on foot, we stumbled into the business office at the back of the cantina, where we were cordially greeted at last. 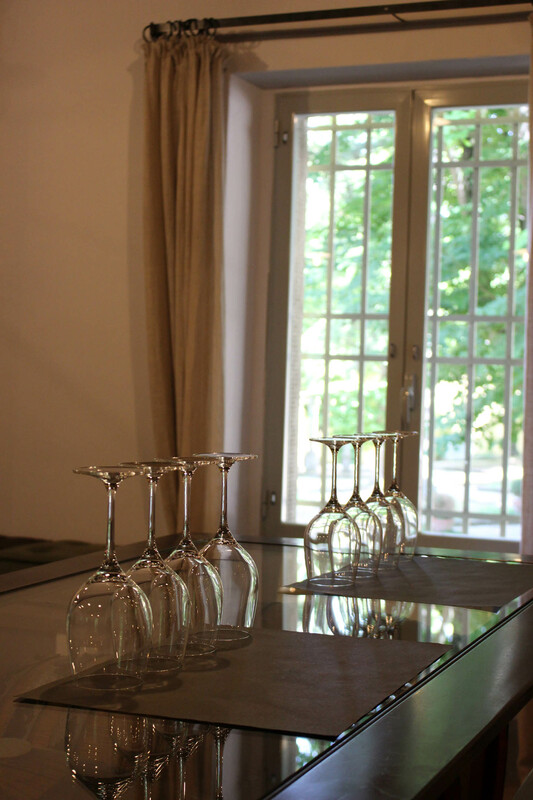 The Salustri family has been making wine in this area since the turn of the twentieth century, making it one of the oldest wineries in the Maremma. Their 50 acre property is located on the outskirts of the Amiata, a series of lava domes surrounding the 5,000 foot high Monte Amiata. 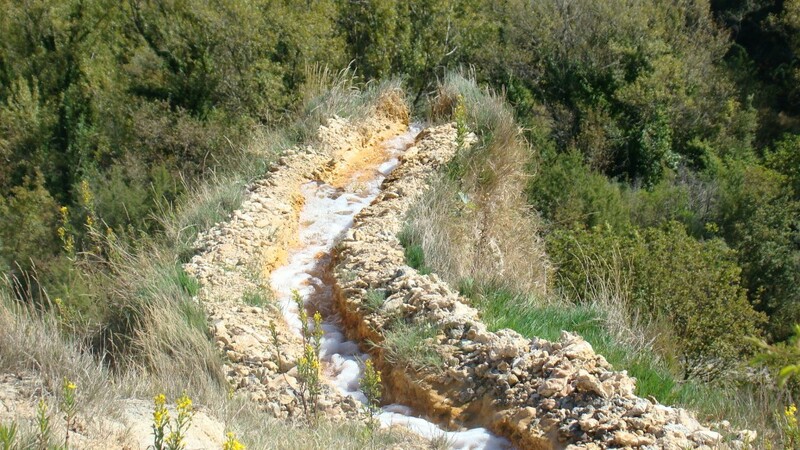 The property is certified biologic, meaning that no pesticides or other artificial substances are used in production. 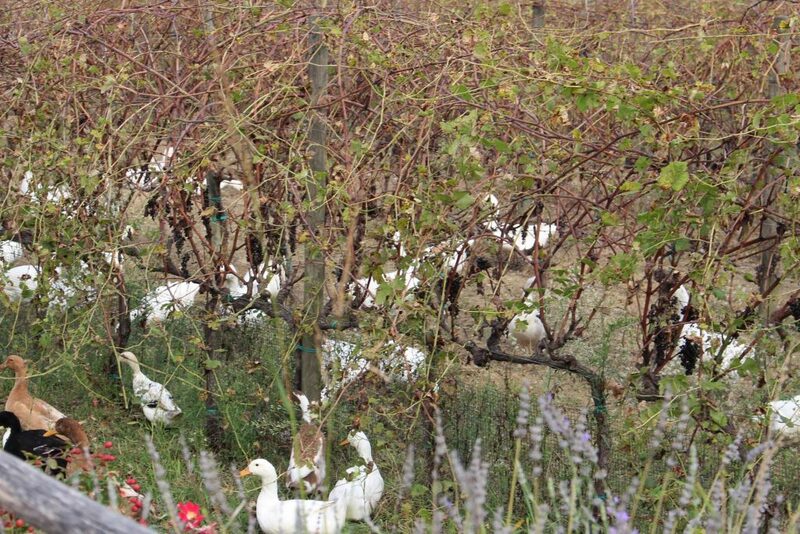 He limits his production to the three grapes typical to the Montecucco region, Sangiovese, Vermentino and Ciliegiolo. Our first sampling here was the Vermentino, which is the primary white grape of the western Italian coast and Sardenia. 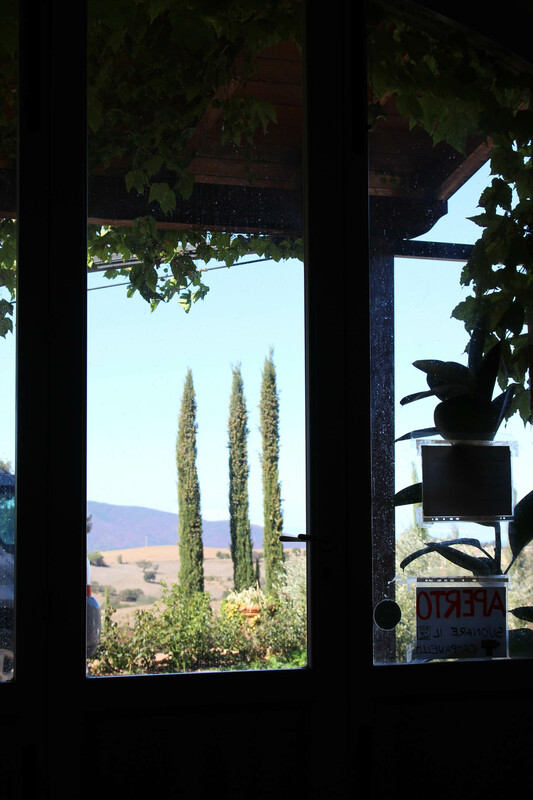 Our host explained to us that his vines were unusual in that Vermentino on his property, while excellent in all other dimensions, lacked nose. 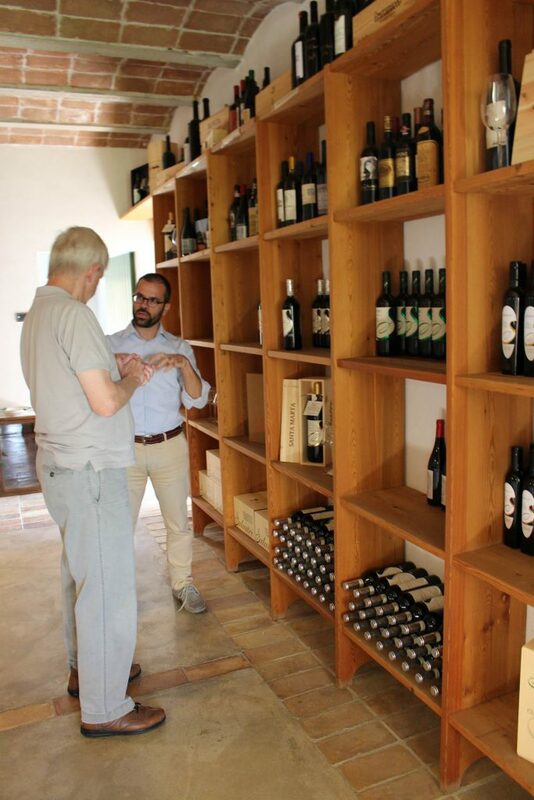 He is very jealous of the quality of his grapes–he works closely with the Eneological Institute of Pisa and his grapes are registered as specific types of Sangiovese and Vermentino there–and not about to replace anything on his property. Thus, he very reluctantly brings in grapes from another property to round out the wine. 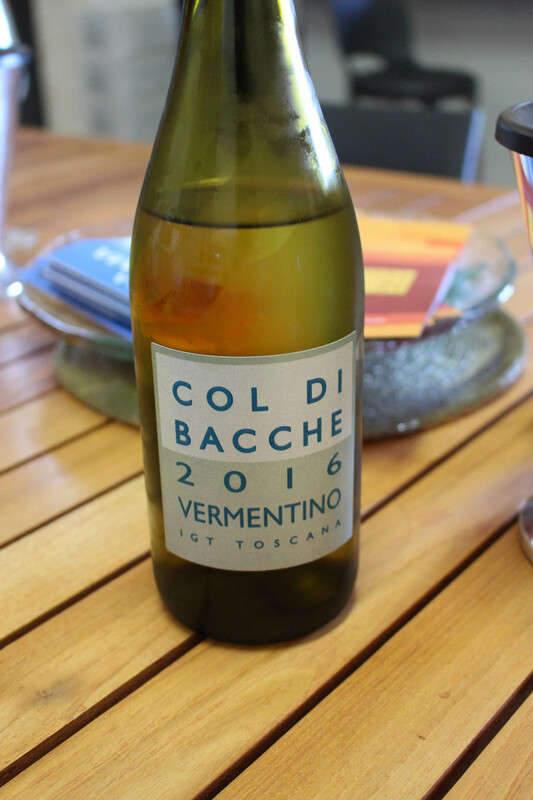 Our Vermentino, the 2015 Narà, certainly was not lacking in this department, having a well-defined mineral nose, not at all floral, but very promising. On the tongue, the wine was mildly acidic and medium bodied with a hint of berry and interesting pear notes in the back of the palate. It had a nice dry finish. Impressive. Our second sampling was the 2015 Marleo Montecucco, a blend of 90% Sangiovese and 10% Ciliegiolo, a local varietal known for its large, red grapes (ciliegio is italian for cherry) used primarily for blending, which lends color and fruity notes. The wine is fermented with the skins for about 15 days, matured in steel vats and finishes with six months in the bottle, giving it a light, “drink me now” air, but with sufficient body to stand up to salami, aged cheeses and other heavier flavors. It goes for about 12€ here, so the price should be right if you can find it. If your palate inclines to the lighter red wines, this one’s for you. 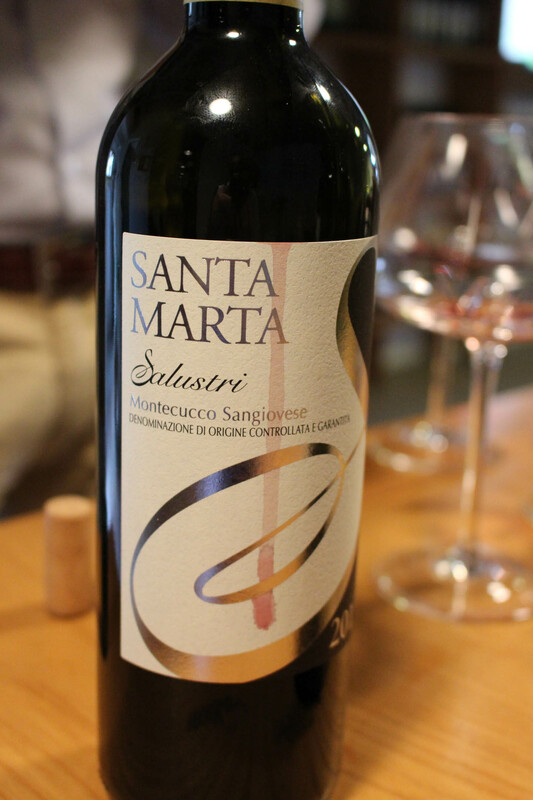 Our final tasting was of the Santa Marta Montecucco. This is 100% hand selected sangiovese with 20 days of fermentation and maceration. To achieve what the winemaker considers the proper balance, half the wine spends 24 months in large (700 gallon) oak barrels while the remainder is kept in steel. According to our host, this lends the wine a taste of oak “from afar” sufficient to bring out the flavors. I agree completely. This is a very large wine, for me comparable to some Brunello di Montalcinos. The oak is there, but moderate, balancing out the fruitier notes and resulting in a dense structure. A lively nose, with strong tastes of black cherries and sage in good tannins. A great finish that sticks with you. This one will go a while. 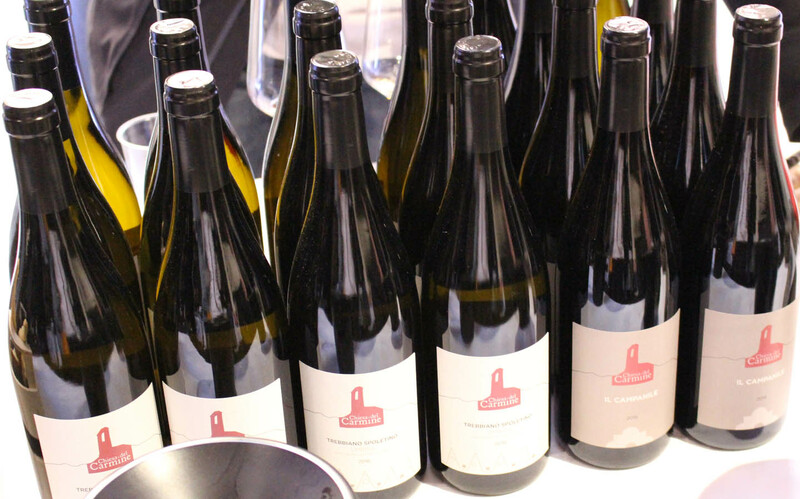 Now the good news and the bad news: Salustri is known for two award-winning single vineyard bottlings, Grotte Rosse and Santa Maria, which in the 2013 (latest) bottling drew rave reviews. Sadly, both are sold out. That’s the bad news. Now the good news: There were a couple of unsold magnums in the house and I got some. I’m sure that we could deal with a magnum, although it might be unpleasant later, but I’m keeping this for truly wine loving visitors. You get here first and you get to drink it. Something to consider. Leaving Poggi del Sasso we make our way towards Cingiano, the center of the Montecucco wine area, for lunch. 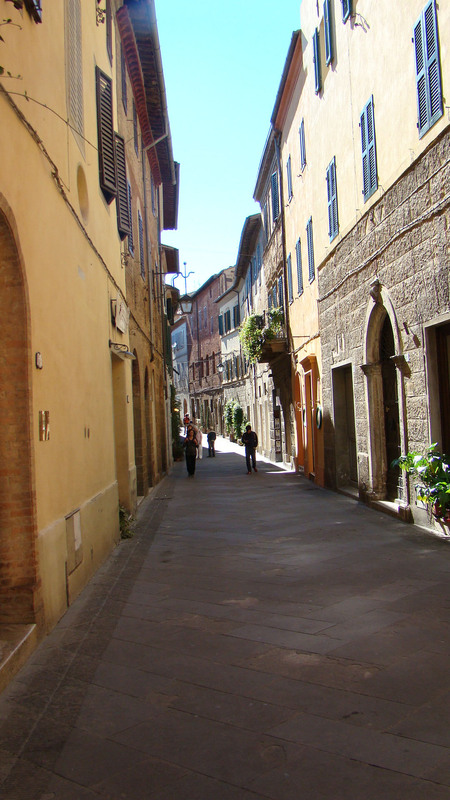 Cingiano is a small hill town whose various districts sit upon ever smaller hills with even narrower streets. Quite exciting in the Porsche. We spot our restaurant, which sits on a small square, and note with horror that there’s no place to park. Nancy isn’t about to let me go back around these narrow streets, so things look iffy. Luckily, we see a sign which leads us to a miniscule parking lot with just enough room left for us. I’ll leave the details of the restaurant to Nancy in her blog, other than to say that it had a huge slice of old-guys-eating-enormous-plates-of-pasta local color, but I will tell you about the wine. 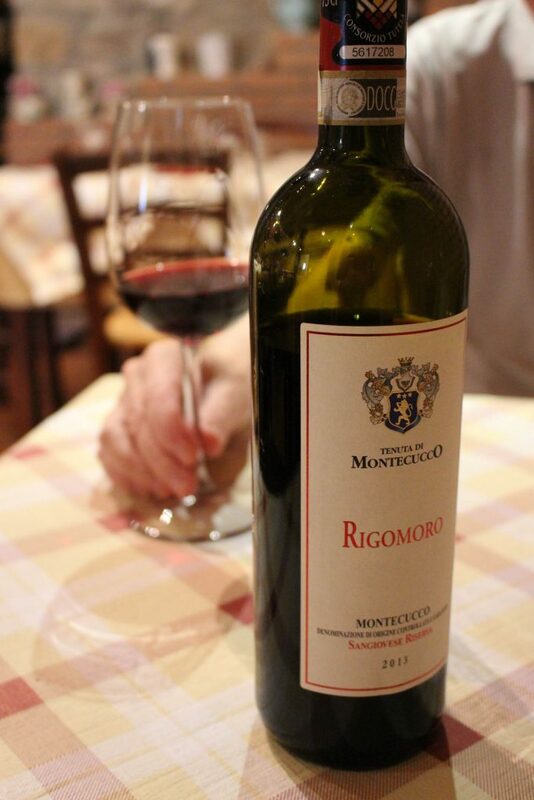 It was Riserva Rigomoro 2013 from Tenuta di Montecucco. It’s a big one, with a fruity nose shot through with a bright note of cherries. Sapid, with moderate tannins that would reward some aging and a satisfying finish. It would really go nice with some strong cheddar cheese. 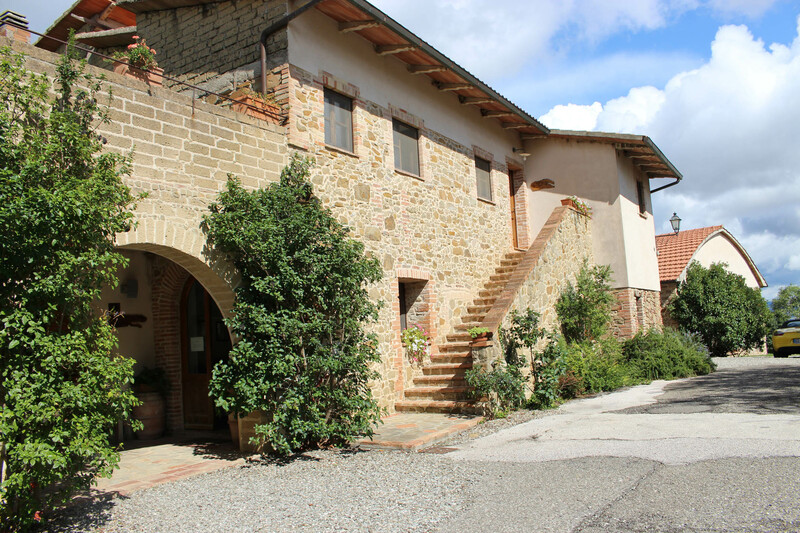 Tenuta di Montecucco is also an Agriturismo, so if you’ve a yen to watch grapes grow in beautiful surroundings, you might want to put it on your list. 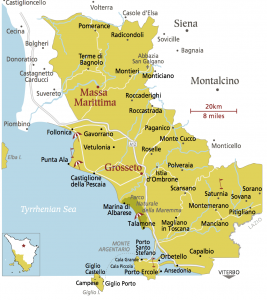 Properly fed, we point the Porsche south south west towards Grosseto and then north west into the rolling hills around Massa Marittima. 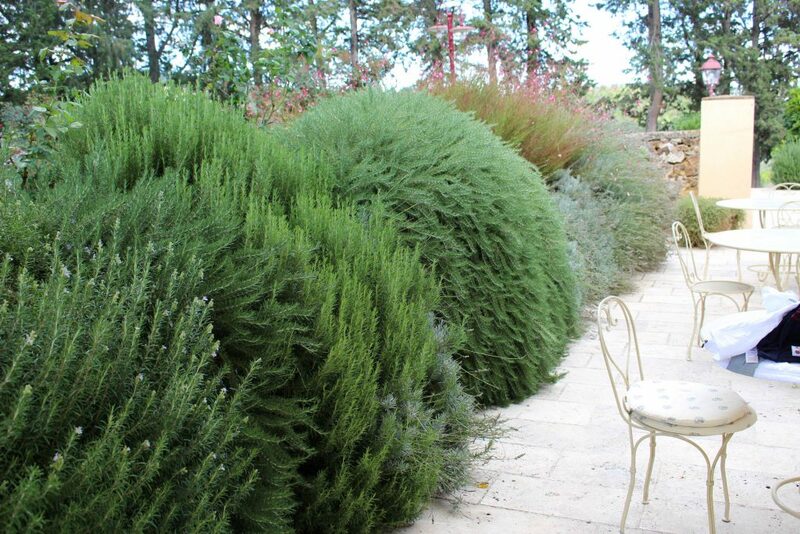 Here, we find ourselves in one of the latest Italian DOCs, Maremma Toscana, created in 2010. Unlike many of the other DOCGs and DOCs, where specific grapes and blends are prescribed, this one, for the most part, satisfies itself with identifying the locality. The allowed grapes and blends reflect the topsy turvy nature of the zone, requiring a minimum of 40% Sangiovese while admitting any combination of red varieties permitted somewhere in Tuscany such as Cabernet Sauvignon, Alicante (Granache), Merlot, Petit Verdot and a vast number of native varietals. The white must be based on 40% Vermentino or Trebbiano, but after that it’s Katy bar the door, with Chardonnay, Sauvignon Blanc, Viognier and others permitted somewhere in Tuscany. As the sun sets, we approach our hotel for a well earned rest. I’ll refer you again to Nancy’s blog wherein our further adventures there. This entry was posted in The Wine Guy, Travel, Wine and wineries on October 18, 2017 by Nancy Hampton. We went for a quick two day getaway to the Maremma which lies on the southwest Mediterranean coastal region of Tuscany. It is a beautiful area. 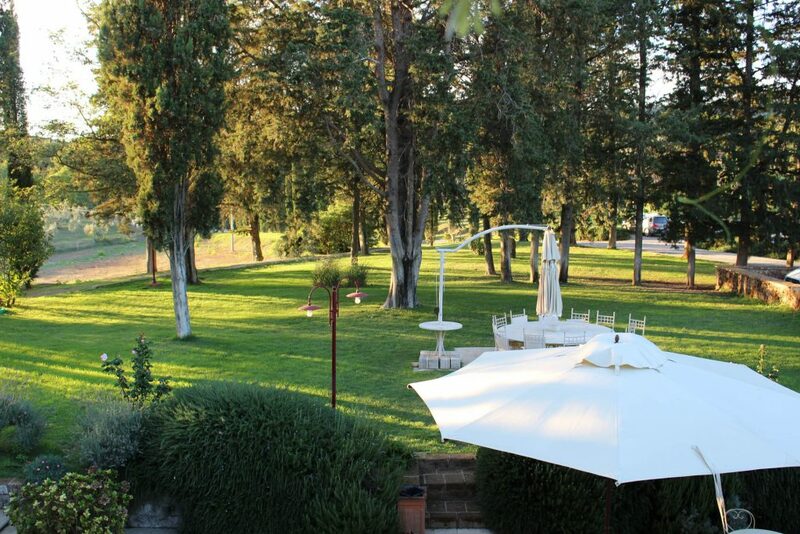 Our agriturismo (Tenuta del Fontino) where we stayed, was made up of thousands of acres. Horses, an entire lake and a person could jog and never leave the property. The house is the main manor and they refurbished an old barn into rooms where our room was situated. Pretty grounds of the hotel. That’s the normal part. Now for the weird part. We went to dinner the first night at 7:30 in the hotel dining room. It was on the upper floor of the manor. When we were seated they ask me “Was möchten sie zu trinken?” Huh? Was I transported to die Heimat? Deutschland? Germany? Turns out this hotel caters to, and is full of Germans. We had noticed everything was in Italian and German but it hadn’t occurred to us this could be the reason. The whole room was full of Germans! And German was the default language. So, we settled in at a table set for three which they said was ours. After we were there a bit a single woman came in – and she was Italian – who joined us. We proceeded with the five course meal. 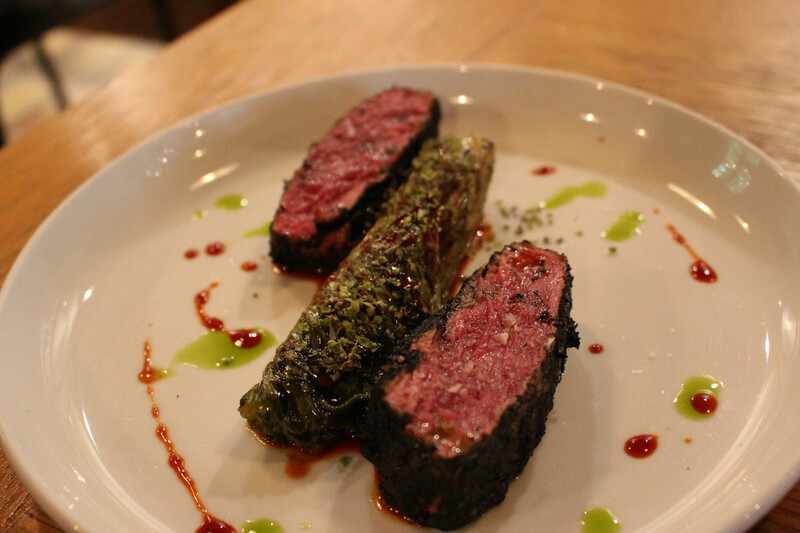 Now I should say, when I read TripAdvisor the people raved about the food. One of the reasons I went here. So, first we saw the hoards of Germans falling on the salad bar…What? salad bar? Where am I? We’ve lived in Germany and I saw it was a typical German style salad except for the cannelloni beans. 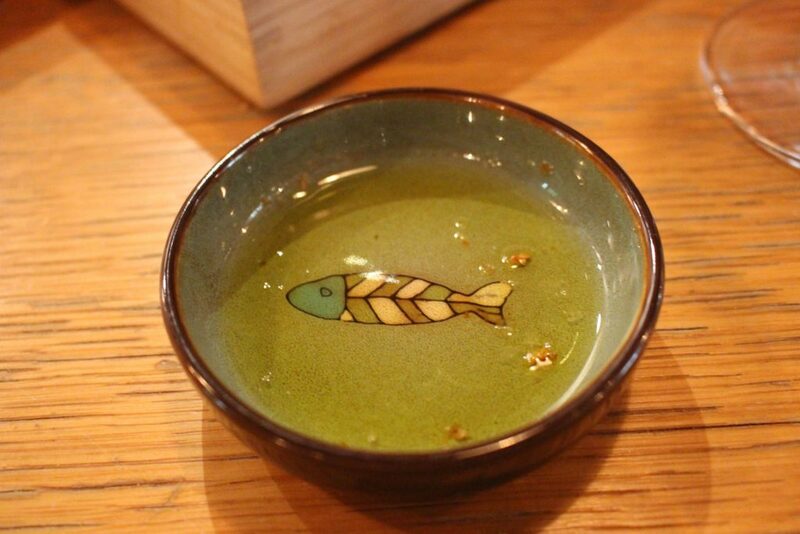 These would figure often into the rest of the meal. 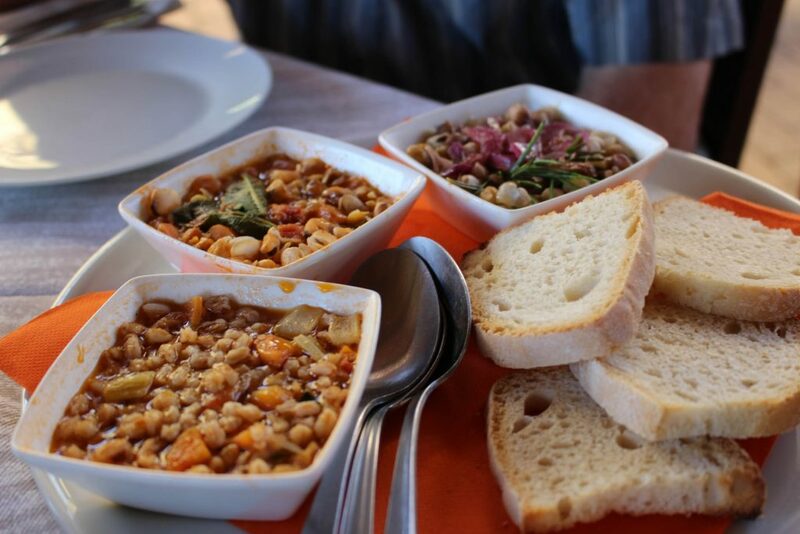 Tuscans are known as “the bean eaters”. Next course was a large piece of toasted bread with cannelloni beans. They had a bit of rosemary in them but overall a very bland dish. Next we had a pasta which was shaped like very short macaroni. Served in a broth that I swear was cannelloni purée with….potatoes!!! Ugh. Again, super bland. Finally we got a very thin slice of roast beef in a bit of gravy. It was obviously a cut meant for long roasting and it had been. It was tender to the point of falling apart. Five boiled potatoes (more potatoes!) accompanied it. The roast was strongly reminiscent of Sauerbraten, a German dish. We opted out of the chocolate mousse, also typically German. 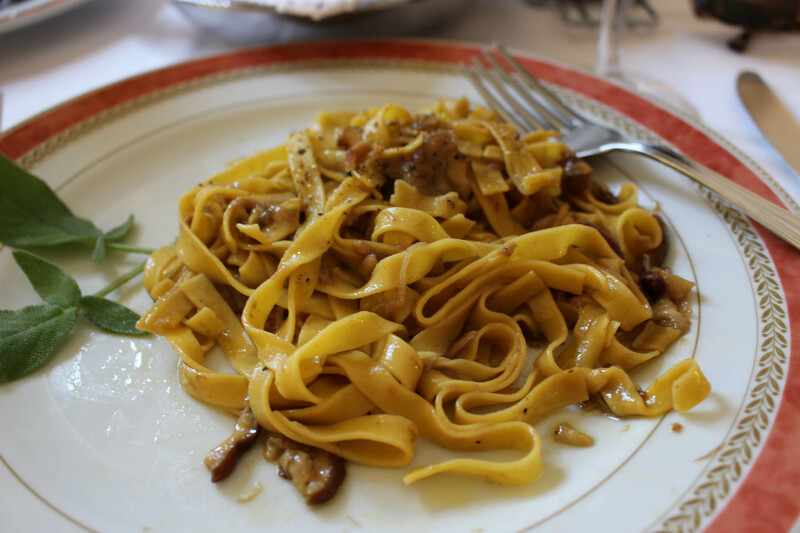 It was maybe the worst meal I’ve ever had in Tuscany, which is known for good food. Our single woman table mate told us she was on a two day getaway from her husband and family and their business. 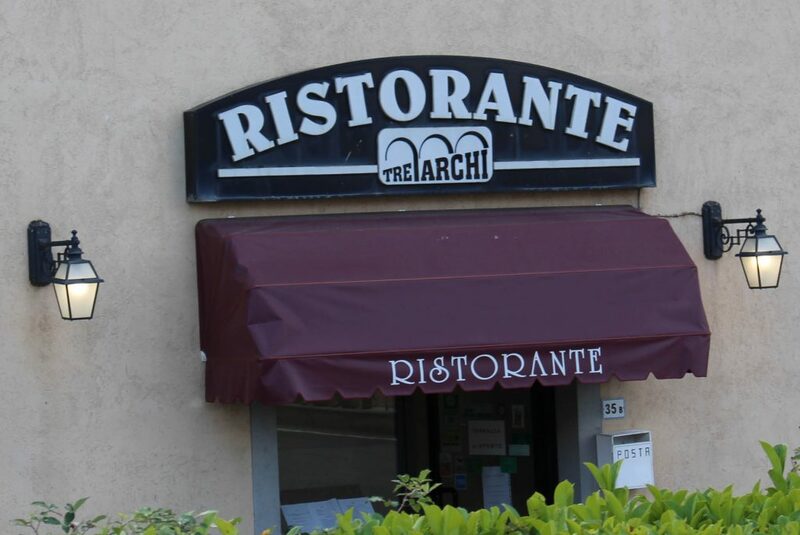 They own a restaurant and hotel in the Livorno area. I thought that was cute. She was very out front that she needed some ME time. So, seeing as she was a cook we asked her about the food and she assured us it was an authentic Tuscan meal. I am still in a state of shock. As an addendum, after we got home I described the dinner to my Italian teacher and she, too, said it was pretty typical Tuscan food. Funny, I’ve been there a lot of times but never disliked the food before. 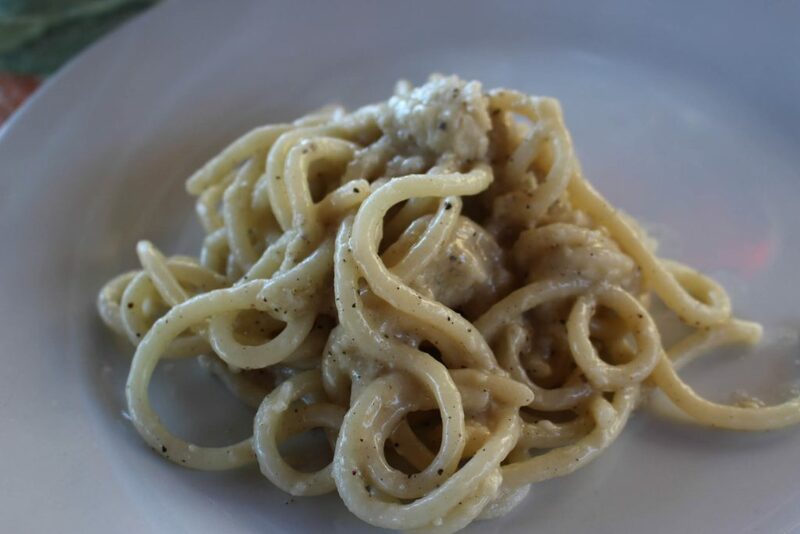 Maybe, since I’ve always eaten in decent restaurants I would not get typical food Tuscans eat at home which was probably what the set, five course meal was more like. So the objective to our trip was to visit some wineries and purchase some wine. The Wine Guy is in his element doing this. There are five main wine regions in the Maremma and we visited our first one on the way to our hotel. I won’t go into describing our winery visits because I know you will read about it in an upcoming blog. We found our lunch which was quite good. 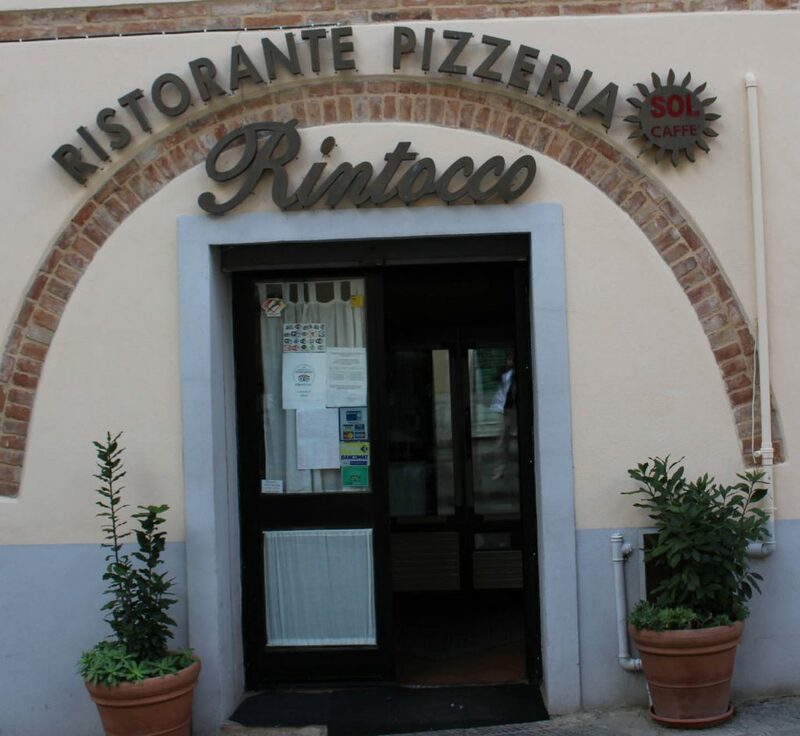 Ristorante Rintocco. They brought out two beautiful fish to show us and a big plate of porcini mushrooms, which are in season now. We split an antipasto which consisted of a bowl of Tuscan soup, a plate of marinated zucchini and a bruschetta with fresh tomato. 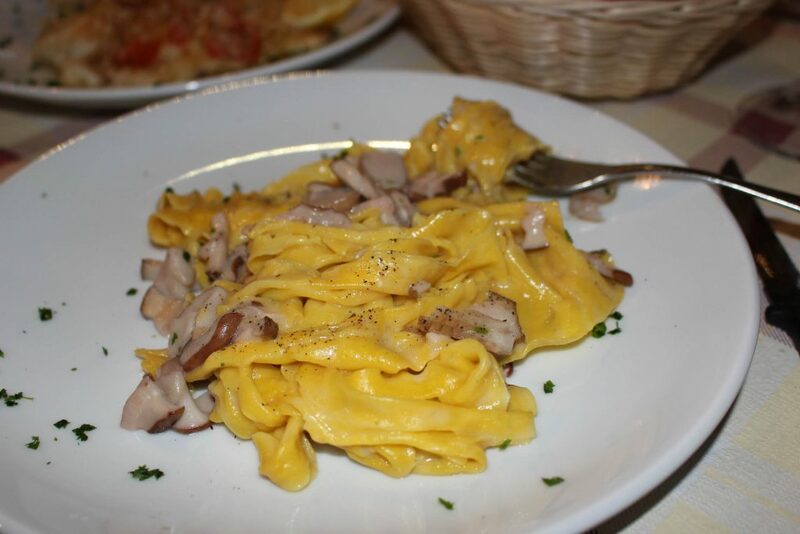 I had the home made tagliatelle with the porcini. 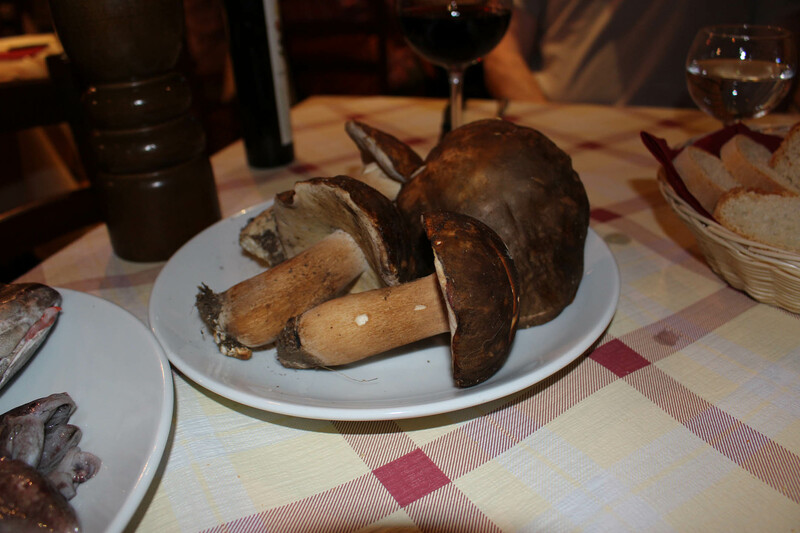 Porcini, (means little pigs in Italian) are the same mushroom called cèpe (in French), and in Germany, Steinpilz (the “stone mushroom”). They are gathered wild in the woods and people make some extra money selling them to vendors and restaurants. Luther’s fish. We were near the coast so there was a lot of seafood and very fresh. The one whole day there we went south of Grosetto, the capital of the area. We visited a small winery with a very nice guy letting us taste all his wines. The business was the father, mother and this son. Fun visit. Off in search of lunch in a small town. Beautiful vista! Town where the restaurant was…alas, it was closed. So we drove to the next town called Scansano which was way up on top of a mountain and fairly big. We drove through and found a parking lot and started walking up the hill. 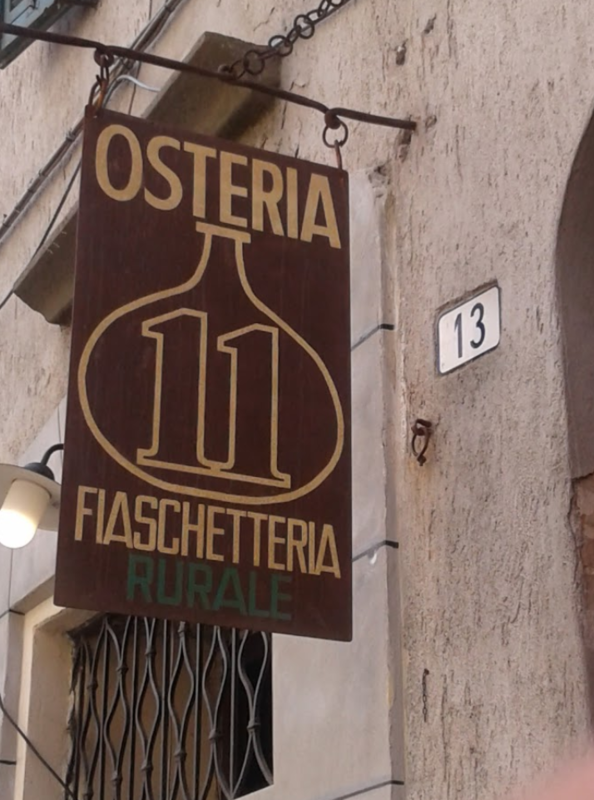 We happened upon this restaurant which turned out to be a lucky choice – Osteria Fiaschetteria Rurale. It was a real dump as Luther said. But the couple running it seemed to care about the food and its presentation. For instance, we had an excellent cheese plate with five or six types of goat and sheep. One goat was super strong and I loved it. 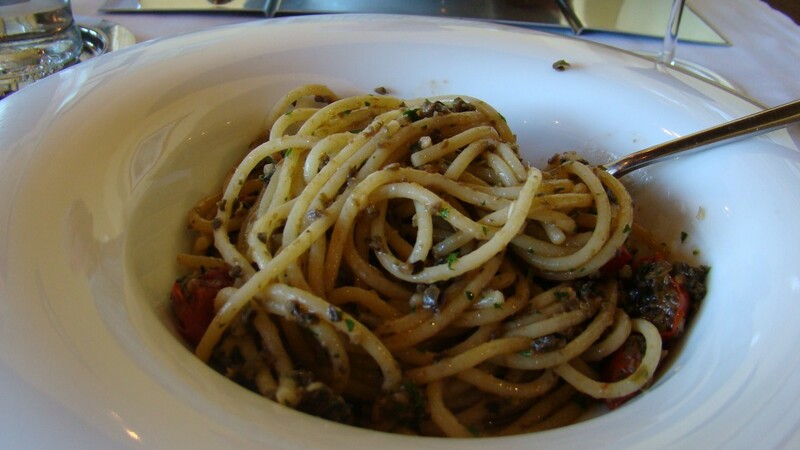 We each had pici pasta which is a traditionally Tuscan shape like thick spaghetti. Nice and dense and chewy. 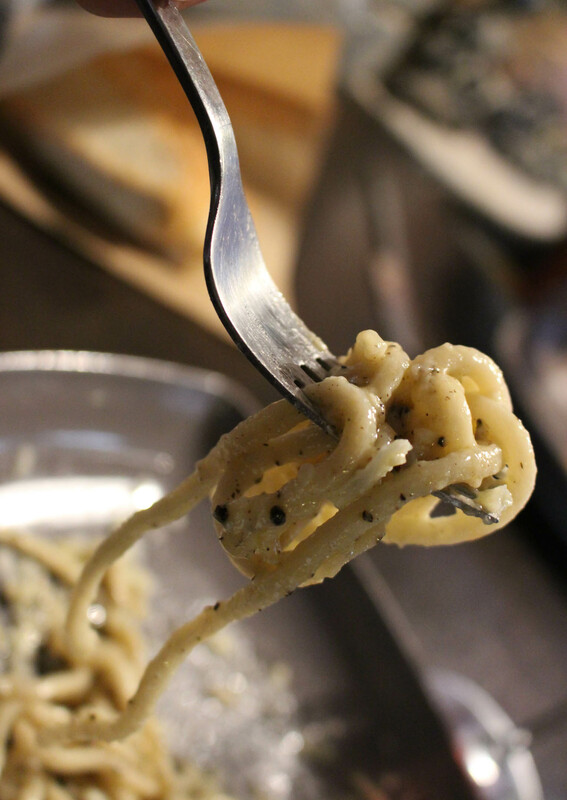 My Pici cacio e pepe…yum! 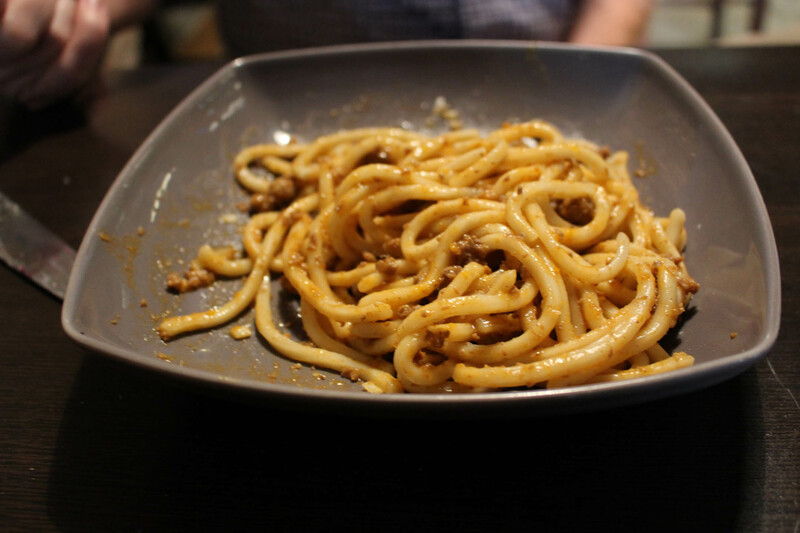 Luther’s pici in cinghale ragu. Afterward, we decided to purchase another cheese plate to take with us for our evening picnic. It worked out well. We had bought some wine which we enjoyed with the small plate which was of mostly meat. I think the lady misunderstood what we wanted. I thought we’d get another cheese plate but turned out to be meats. Many very fatty. Luther liked them so I didn’t eat much. It was a nice light meal with not too much wine. The next morning we headed home. We stopped in one more winery which didn’t let us taste but Luther bought six bottles. He was lamenting the fact that there was still space in the car for more! The weather was beautiful. We put the top down and drove through the Tuscan mountainous center. We passed near San Gimignano. When 1 o’clock came around we began looking for a place for lunch. 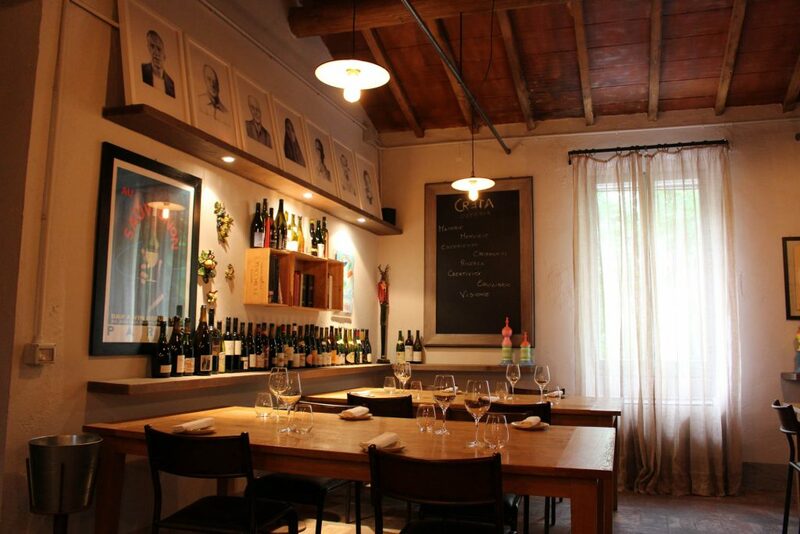 And we found a cute little place called Ristorante Tre Archi. First the proprietor brought a little cart with six olive oils to try with the bread. Yum! Then I had Tuscan onion and potato soup. Toasted bread to put in it. Very like French onion. And tagliatelle house made, with fungi porcini again. Since these big mushrooms are very much in season I took advantage. 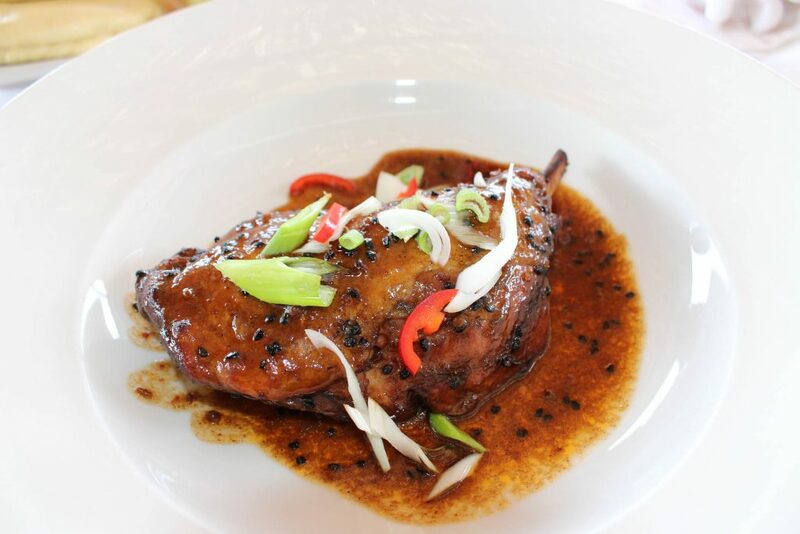 Luther had Ribolitta, or Tuscan bread soup, and lamb chops. Over cooked. The man, I assume the owner there, was super nice. We arrived home about five pm. A productive and fun trip. This entry was posted in Eating, restaurants, Travel, Trip Report, Uncategorized, Wine and wineries on September 25, 2017 by Nancy Hampton. 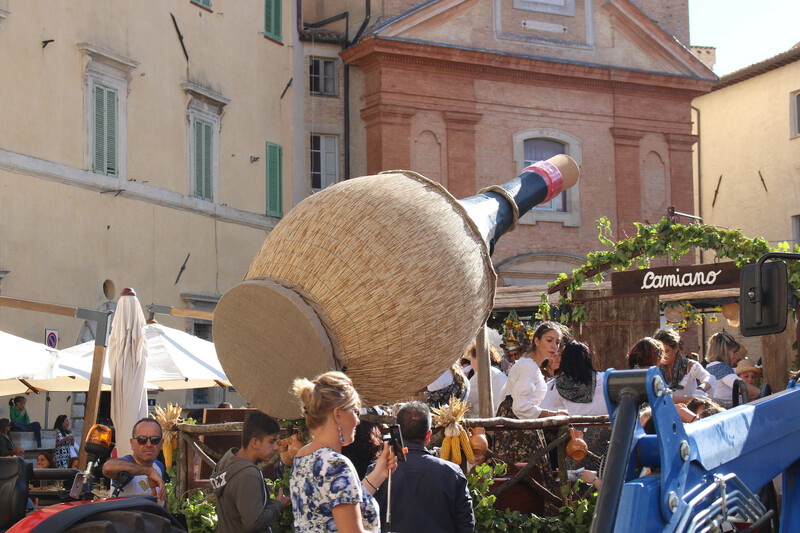 Sunday was the last day for the Montefalco Wine Harvest festival. It’s a four day event to celebrate the harvest of the famed Sagrantino grapes among others. We had made reservations for lunch in L’Alchemista for lunch and invited new friends to join us. The weather was perfect. Very fall-like, a bit cool at lunch as we were seated next to a downward tiny street up which a strong, cool breeze was blowing. Lunch at L’Alchemista was good, as always. They were packed so service was a bit slow. As we sat there crowds started gathering in the piazza and announcements were made from an upper balcony on the Comune building. And a group of costumed women sang folk songs. There was to be a parade of floats pulled by tractors. I love stuff like this. No pretensions. Down the main street we found the building where they were holding the wine tastings. This was our main reason for going. You pay 10 Euro per person and you get a glass and a little bag to wear around your neck to hold it. Then you can do unlimited tastings. There were a LOT of tables with a LOT of wine. One of our friends concentrated on the Sagrantino while I tried the Montefalco Rosso as well as the Sagrantino and a white made from Grechetto, Vigonier, and Chardonnay. All were very good. The Sagrantini were very dry to the point you felt all your saliva disappear. Once we’d gotten our fill we headed back up the hill to the piazza where the parade was in full swing. 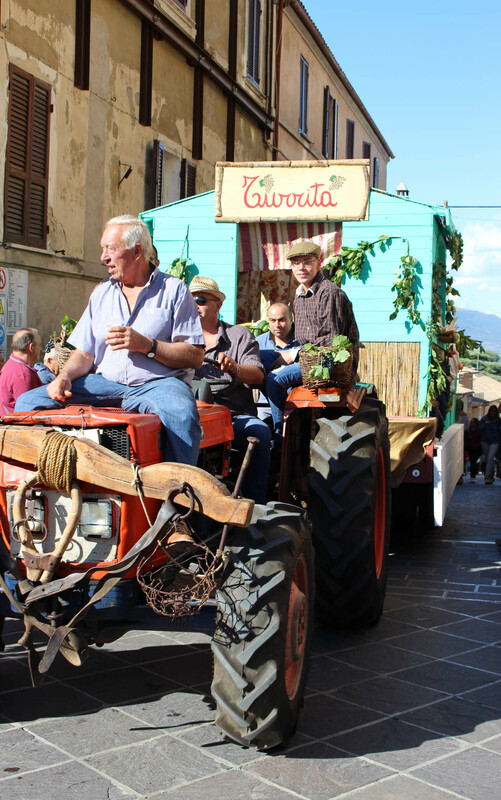 They drive the tractors up another street into the piazza and park them around the edges. The floats, of course are wine oriented and lots of fun to see. Here are some pictures. I love how this guy had put a yoke and harness on the front of his tractor, like it’s a horse…I guess it is, more or less. 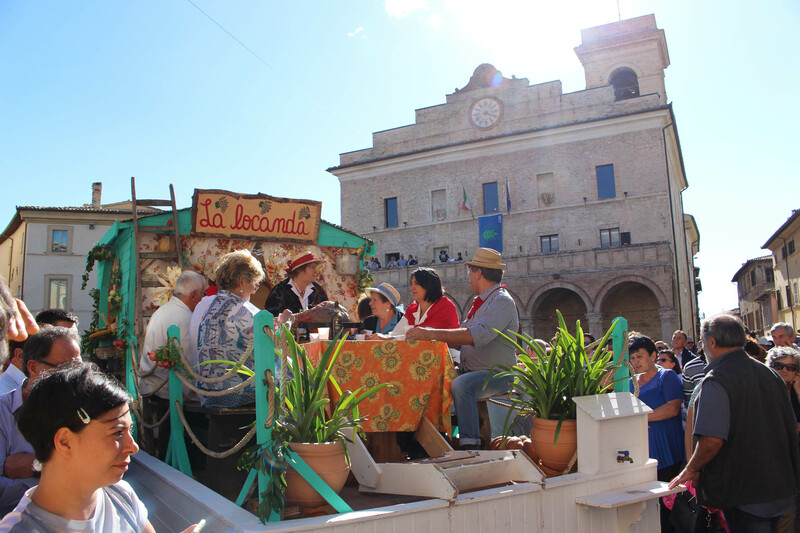 And these folks are sitting on the float “a tavola” enjoying wine and a repast! Loved this giatantic wine bottle on one float. It was one of the best Sagre I’ve ever been too. I’d go back! A couple of pictures of the major storms we woke up to on Saturday morning. The storms here generally come from the west. Our view is West/Northwest. 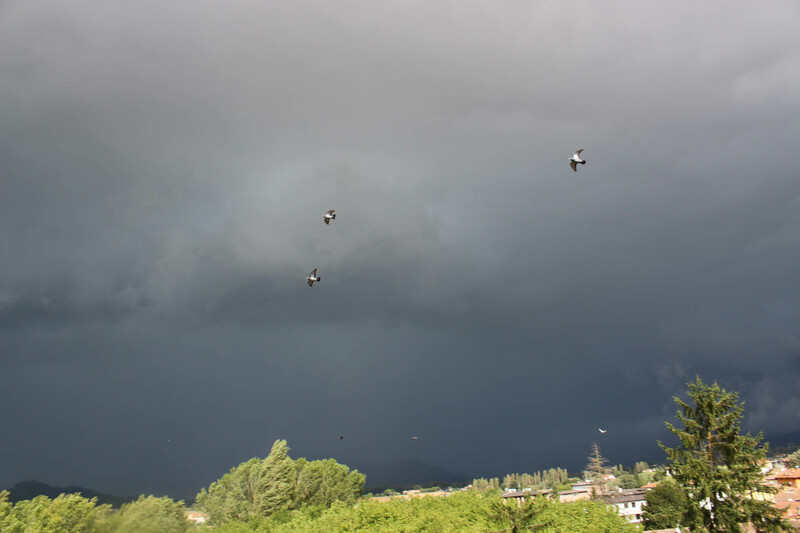 These storms relentlessly moved from left to right and ever so slowly got closer and closer. Finally they got here but we were spared the brunt of the rain. Later in the day I noticed the Tiber river was swollen with rainwater and brown with mud. All came from up-stream where these massive storms must have dumped copious water! 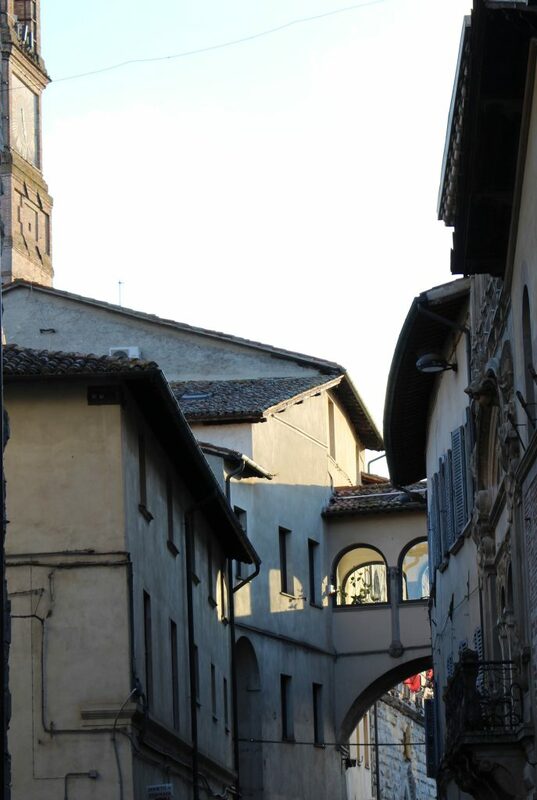 This entry was posted in everyday life in Umbria, Festivals and Sagras, restaurants, Tiber photos, Umbertide, Umbria, Wine and wineries on September 18, 2017 by Nancy Hampton. Yes! 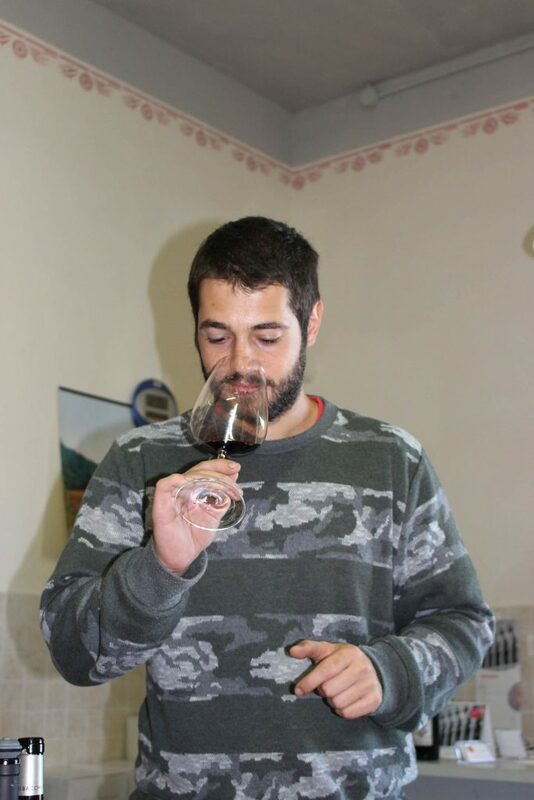 It’s the Wine Guy with a new guest blog article for us. Like the cooling northern winds that are finally driving out the last of four hellish heat waves from north Africa, I’m back to talk a bit about the upcoming harvest and to tell you about two white wines I think you’ll find very interesting. 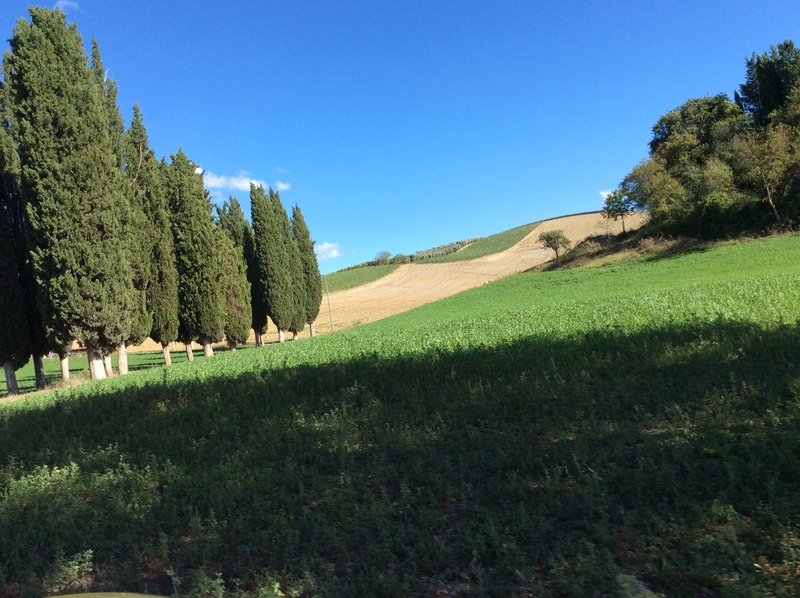 First, though, let’s talk about the weather: For those of you who haven’t been reading Nancy’s blog, and she knows who you are, we’ve been in the grips of an incredible drought here in central Italy. Until yesterday, September 1, we had not seen a substantial rainfall since April. Meanwhile, as I mentioned earlier, the country has been lashed by waves of heat from the north African desert sending temperatures above the 100 degrees Fahrenheit mark for literally weeks at a time. The situation became so bad that the reservoirs around Rome were reduced to literal mud flats, resulting in water rationing and shutting down of many of Rome’s fountains. On a recent trip to Sienna, we were shocked by the tilled-over fields, which had turned grey under the heat and resembled a moonscape. It is quite shocking to see a normally green landscape transformed so completely. Normally, a long, dry summer would be desirable for the vintners, since the aridity and heat, concentrate the juice and produce a wine with amplified varietal character. 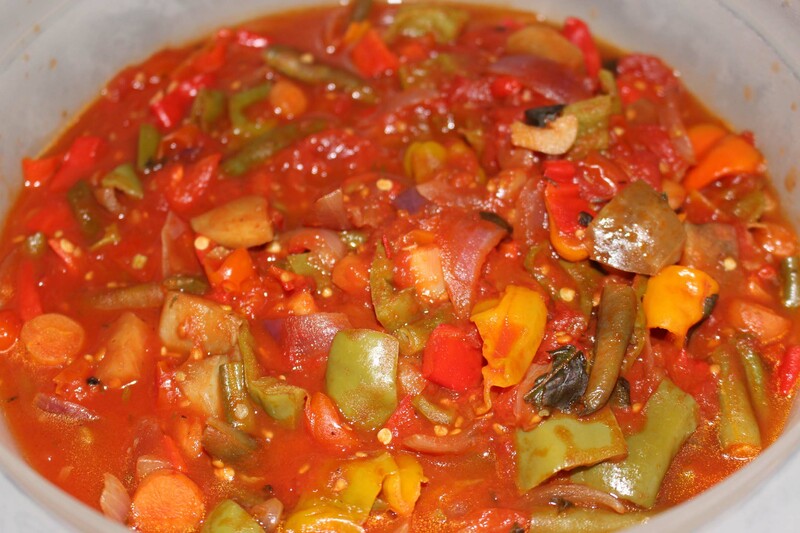 There is usually a reduction in quantity, but it is offset by the increase in quality. Here, we may have had a little too much of a good thing; in fact, the latest estimates put the yield Umbria at around 60% of last year’s harvest, with Tuscany and the other central regions at about 70%. 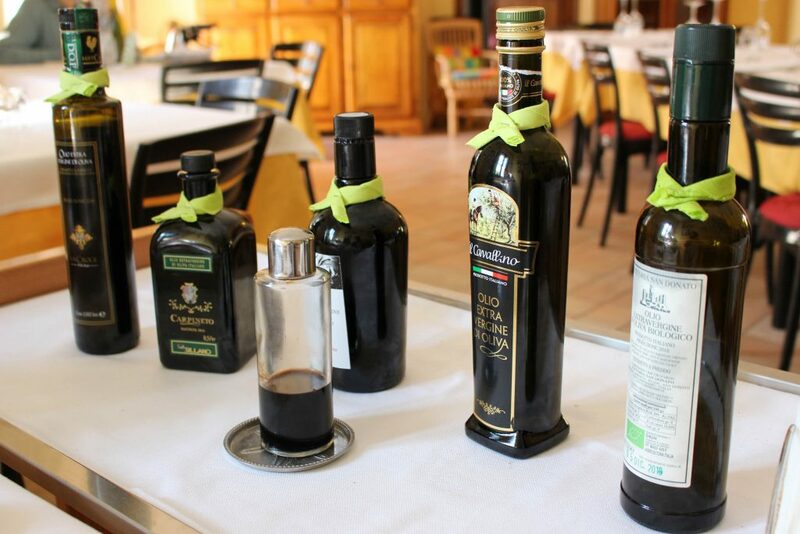 At these levels the juice produced may be so desiccated that the quality as well as the quantity of the wine produced could be seriously affected. The first harvests in Umbria, sauvignon and chardonnay, have already started to come in and the results have been cautiously positive. In Orvieto, the yields have fallen by almost 50%(! ), but the overall quality of the juice has been exceptional. 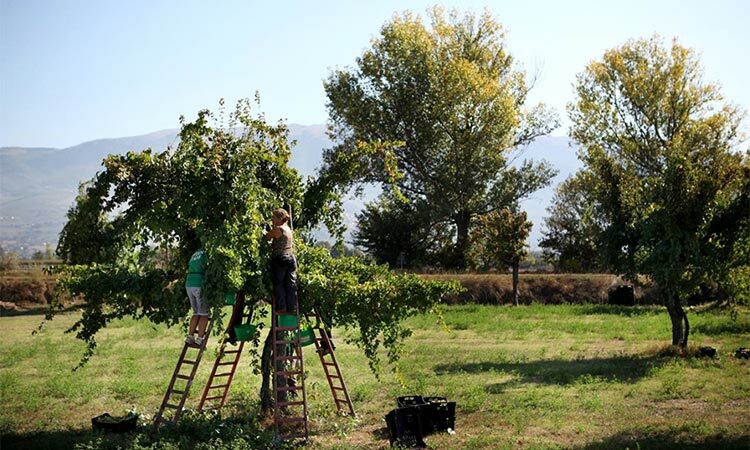 The grechetto harvest took place last week with reports that there was little evidence of desiccation and that the bunches looked exceptionally healthy. Some growers in Orvieto are optimistically discussing a “vintage of the decade”, on a par with 2007, the last truly great vintage in Umbria. This may be a bit premature, as a key component of most wines from Orvieto, does not usually come in until early October. Time will tell. The harvest here seems to move from the west to the east as the percentage of late ripening grapes is concentrated in the eastern areas around Montefalco. 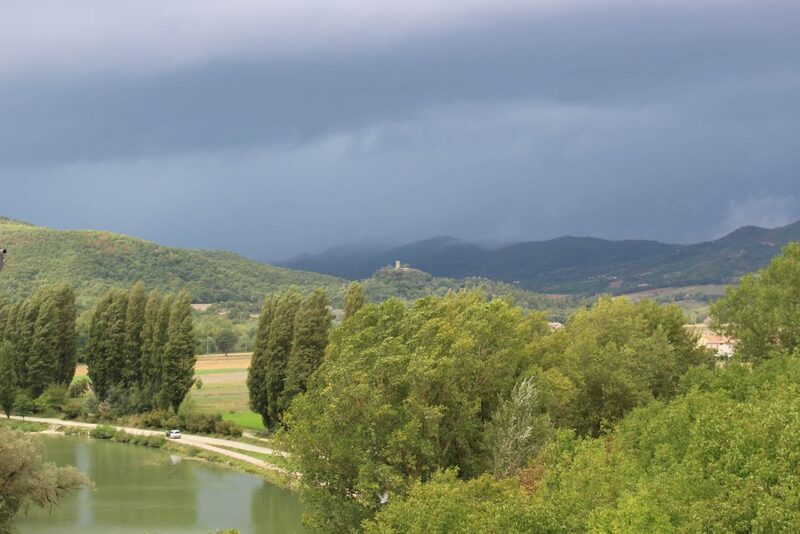 In between, we find Lago di Trasimeno, with a concentrations of both white and red wines. The whites, chardonnay and pinot bianco, are used to make a particularly fine metodo classico bollicine (can’t use that cham***ne word) that is treasured by the locals. There was considerable anxiety in July that the continuing heat wave could result in appassimento, the wilting of the vines in the heat. The white wine harvest, which began here August 18, turned out happily however, with expectations of grande qualità and reasonable yields. The early arriving red wines, gamay (yes, as in Beaujolais) and pinot noir, came in immediately after the whites. Again, the yield is down, although not so drastically as in Orvieto, and the quality is quite high. 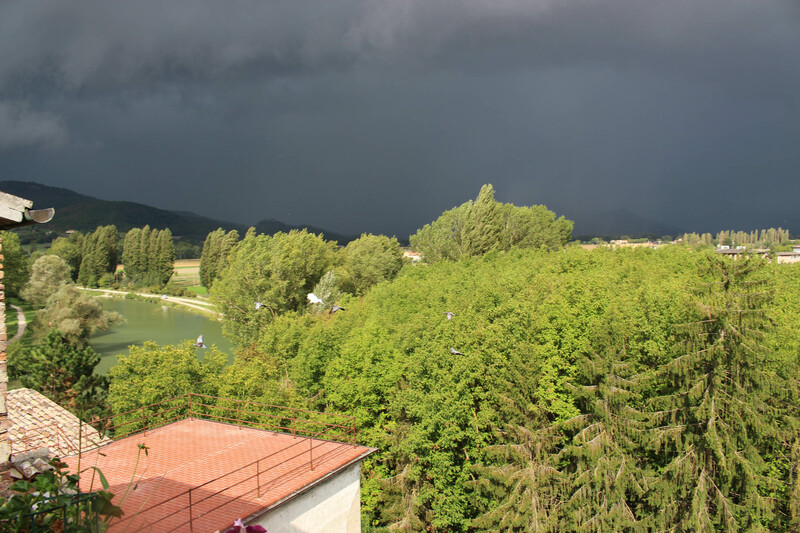 Perhaps the lake, second largest in Italy, exercised a moderating influence on the climate. Finally, let’s turn to the Montefalco area. Here, the bunches are hanging heavily on the vines and the intense heat has caused the red wine grapes to change color early, which would usually indicate an early harvest, but appearances are misleading. In reality, the sugar content of the grapes is too low and the acidity is very high. This has producers looking at a more “usual” harvest in late September for the merlot and the sangiovese and October for the sagrantino and the trebbiano spoletino. The vintage is looking a little more promising as the heat has finally given way to cooler weather and thunderstorms and small rains have given the grapes a respite. I think that the words “cautiously optimistic” sum up the general situation. As I’m typing this, Nancy tells me there’s a whopper storm on the way. As long as it doesn’t turn into Harvey or Irma, that’s good news. 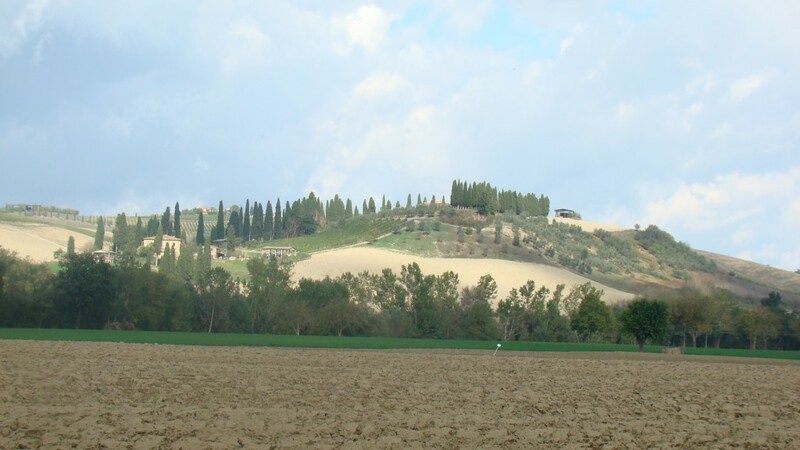 Just to round out the rest of the predictions: Tuscany is looking a lot like us, with limited yields and good quality. A little rain now would be a plus and it appears that they’re getting it. The Veneto, where most prosecco comes from, has been a disaster, with mudslides throughout the spring and alternating rain and high heat. The mudslides appear to have been made worse by overplanting. Prosecco is the drink du jour in Europe right now, so the wine producers are planting like mad. I have a bad feeling that by the time the vines really begin to produce, the world will have moved on, and the Veneto will find itself with tons of unsellable prosecco. Maybe not, such is the life of the producer. The rest of Italy is looking at a nice harvest. The kind of hot weather we’ve been experiencing is par for the course in the south with the exception of western Sicily, known for a grape called grillo not seen very much in the USA, but the main component of Marsala wine. Keep your eyes out for nero d’avola (red) from Sicily, Fiano di Avellino and Grecho di Tufa (whites) from Campania and primitivo and aglianico from Puglia. They should be great and the costs, even with the dollar down almost 20%, should be good. Finally, I’d like to tell you about two white Italian wines I’ve discovered with these interesting characteristics: (1) You can find them in the US; and (2) They exhibit a good aging(!) potential. The first wine is from a local Umbrian grape, trebbiano spoletino. It’s a low-yielding local variant of trebbiano that, in its native state, grows in trees. It is well known as a “neighborhood” wine: that is, its only production was by families willing to invest the labor necessary to cultivate the vines. Real winemaking businesses were not particularly interested for many years and it remained a local curiosity. 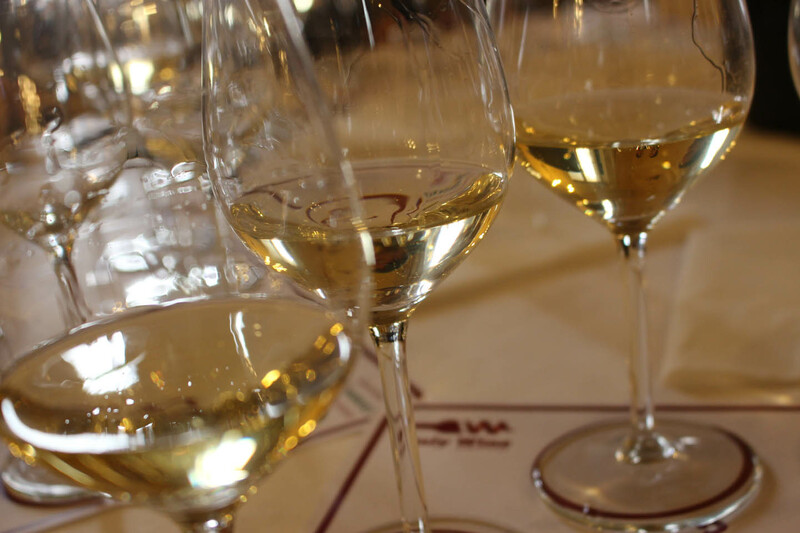 Trebbiano spoletino has become a sort of boutique wine in recent years and there are now several relatively large producers who cultivate it in the standard posts and wire method. 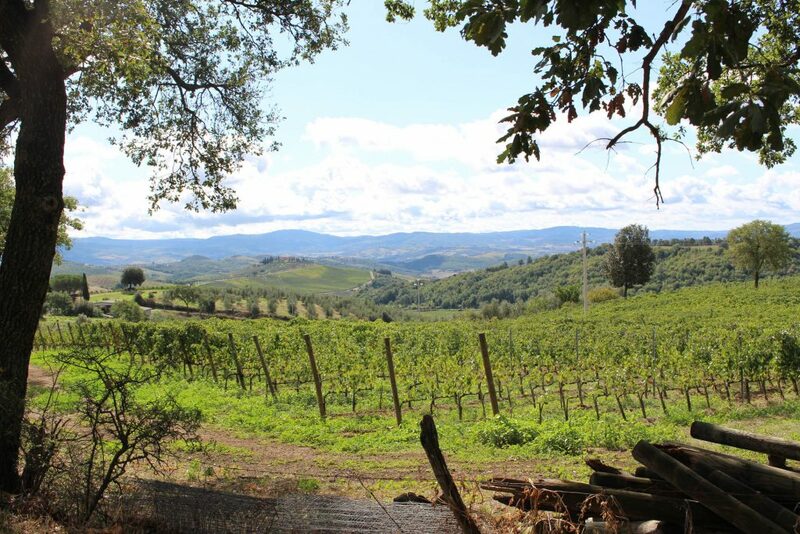 However, there is one winemaker, Tabarrini, who produces trebbiano spoletino from 60 year old vines in the traditional way, cultivating the grapes in trees. They do this today as an homage to one of the original founders of the vineyards, Armando, who was one of the first to recognize the value of the grape here and, according to his grandson, took a particular delight in going up and down the ladders at harvest time. 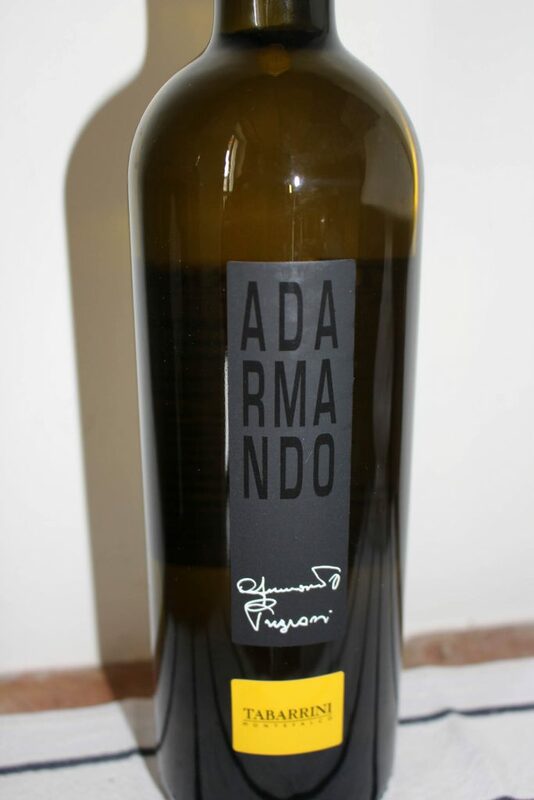 The wine, Adarmando (to Armando) preserves his name. I’ve included a couple of photos to give you a feel for what the grapes and the harvesting process look like. At our last visit to Tabarrini, we were offered several older vintages, 2009 and 2010, and invited to compare them against the current 2015 release. We were pleasantly surprised. The 2015 vintage is quite good, with good minerality and overtones of fresh fruit. In the mouth, it has a distinctive character, unlike many whites, which just come across as a bit liquid. The previous vintages exhibited these qualities, but in a rarefied way, with a softness and additional depth of character that was quite surprising. I wouldn’t argue with anyone who wants to drink the 2015 now, it’s delicious, but the aging did seem to transform it to a higher plane. I decided to play my cards straight down the middle and bought a batch for now and a batch to go down. I don’t see it going more than five or six years, but I think those who wait will be rewarded. You can order the wine from www.tabarrini.us at $19.43 a bottle plus shipping. It’s available at some restaurants in the Washington, New York and San Francisco areas and at some specialty wine stores, but with a production of only 8,000 bottles a year it is probably going to be a bit hard to find. For those of you who want the gory details, the grapes are grown at about 1000 feet in silty, clay soil and harvested in mid-October, unusually late for a white wine, but typical for this varietal. It spends twelve months in stainless steel tanks on the lees, meaning the left-over yeast particles from the fermentation are left in the tank. 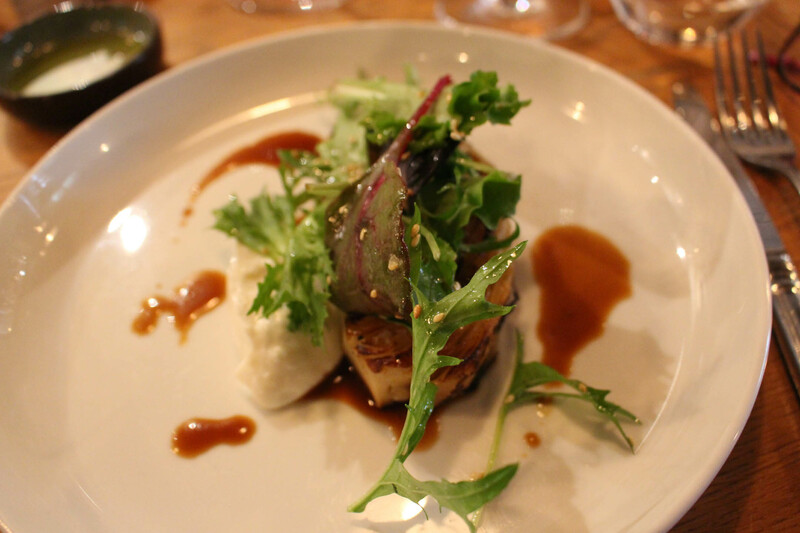 This imparts what is usually described as a creamier, richer flavor to the wine and adds complexity. After the fermentation the wine undergoes six additional months of bottle aging before release. A considerable amount of work for a white wine, but worth the effort. 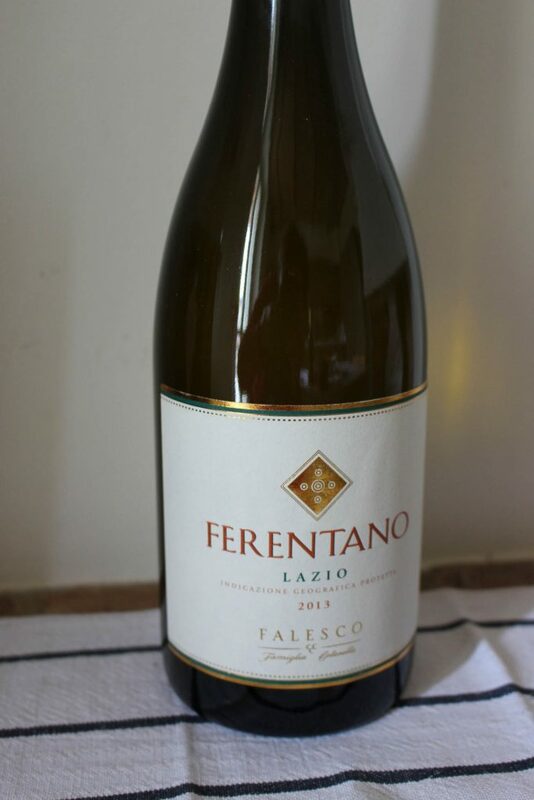 Exhibit number two comes from just a bit south of the Tuscan border with Lazio, from the producer Falesco. 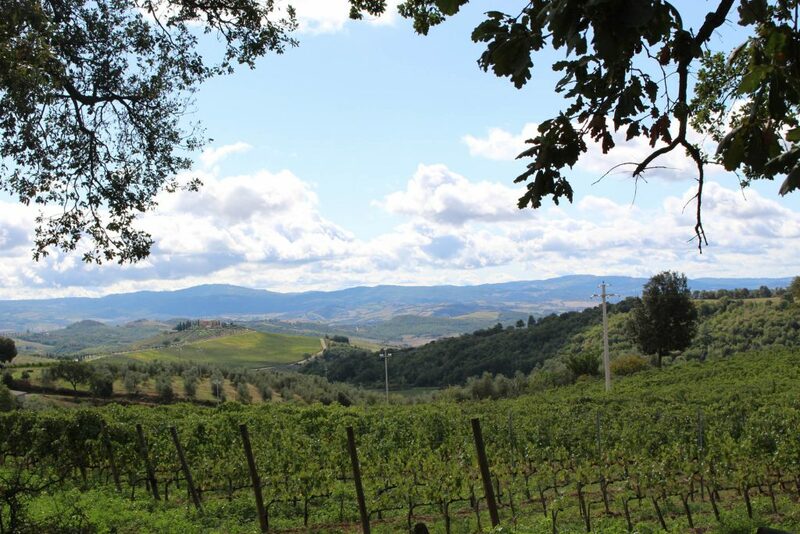 Falesco is a major producer, nearly 3 million bottles, from 370 acres of vineyards in Lazio and Umbria. Falesco is best known for its monster merlot, Montiano, which is widely available in the US–I’ve seen it at Total Wine in the Washington DC area. It also produces a cheap local style wine with the cute name “Est! Est!! Est!!! di Montefiascone”. Mark Twain once remarked that Wagner’s music was “better than it sounded”. In the case of “Est! Est!! Est!! !” (Est! = it is!) the name is better than the wine–give this one a miss. But I digress. The head of Falesco, Riccardo Cotarella, prides himself on discovering and preserving ancient, indigenous wines from extinction. 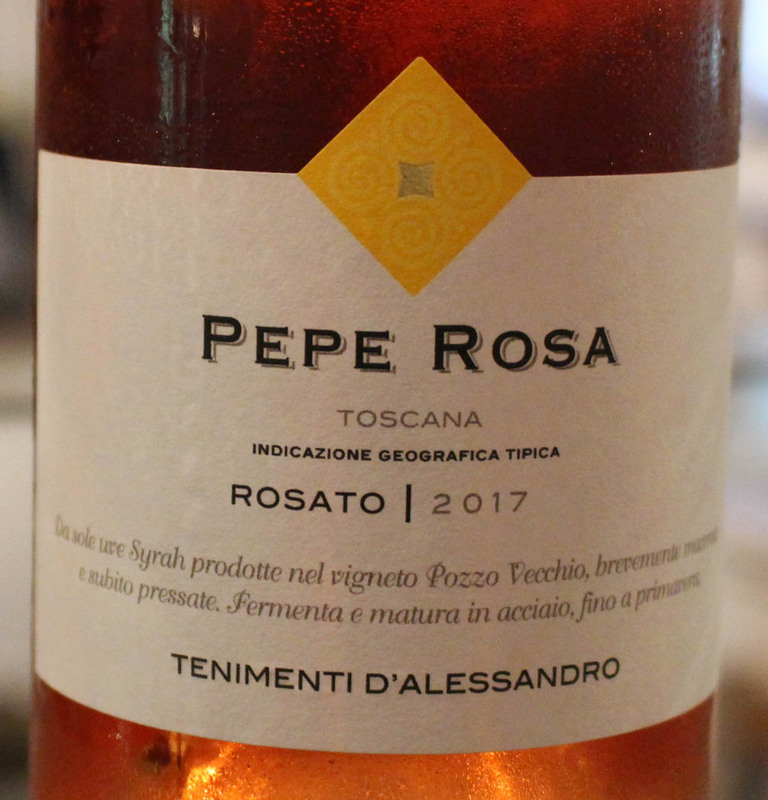 One of his most notable finds was roscetto, a varietal found near the ancient Etruscan town of Ferento, from which it takes its name, Ferentano. Like trebbiano spoletino, roscetto is a late maturing (late September), low yielding grape with good sugar content and aromas. 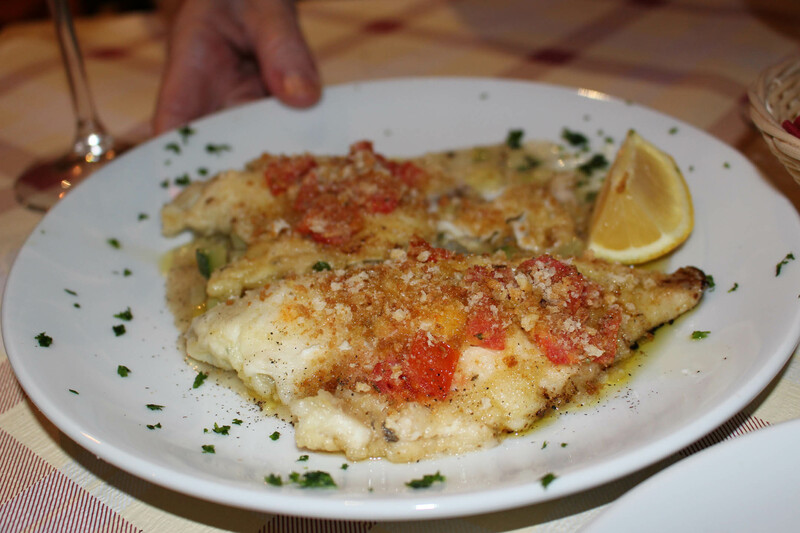 We had the good fortune to discover the aging potential of roscetto at restaurant Pascucci al Porticciolo, a fantastic fish restaurant with an attached hotel of the same name but under different management about a 20 minute cab ride from Rome’s airport–secret tip: go there!. 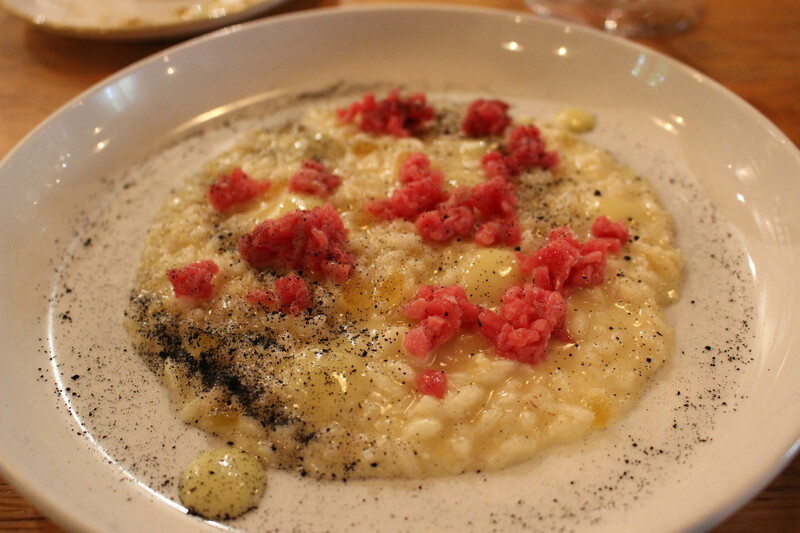 The restaurant feature vintages of Ferentano going back to 2004 and we tried two. They were amazing. As with the Adarmando, let’s talk about the latest vintage first, the 2016. It has a beautiful golden hue with roseate tinges, reflecting the results of the dry ice process used during maceration. 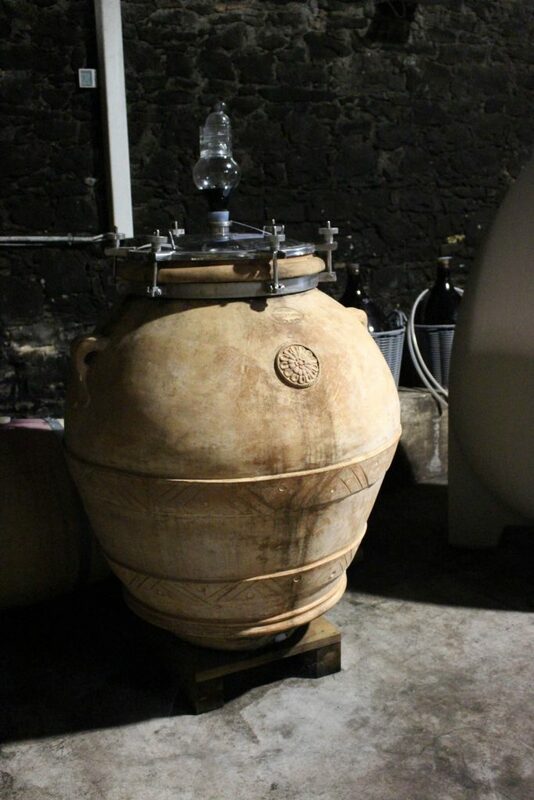 The wine, which sees four months in barriques, small (250 liter) wooden barrels, shows a buttery taste reminiscent of good chardonnay. The taste is forward, with lots of fruit and a lingering finish. There is a bit of tannin on the mouth, due to the oak aging, but it’s not unpleasant. The older vintages show these qualities in a softer and more multi-layered way. It’s not like the aging of sagrantino, which turns pit bull tannins into lap dog esters; it’s more subtle than that. But the tannin has been tamed and once again, you see a softer, rounder result with many dimensions, not a normal quality in anything but the best white wines. 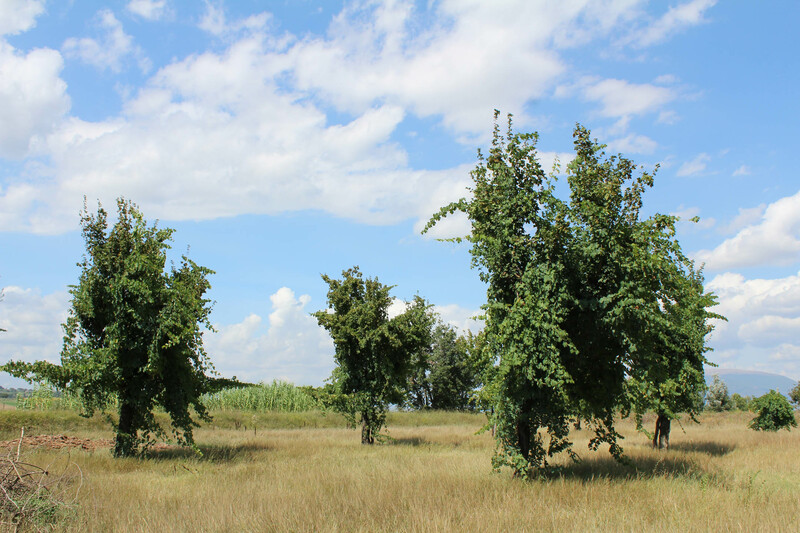 For the technically interested: Riccardo Cotarella has said that his goal was to emphasize the varietal characteristics of the roscetto grape. To achieve this, he developed a process using dry ice(!) during maceration, the time when the tannins, coloring agents and flavor compounds—are leached from the grape skins, seeds and stems into the freshly pressed juice. This is carried out in stainless steel vats over a period of four months. Following that, the wine sees four months in maleolactic fermentation in barriques, a process usually reserved for the better reds and fine chardonnays. 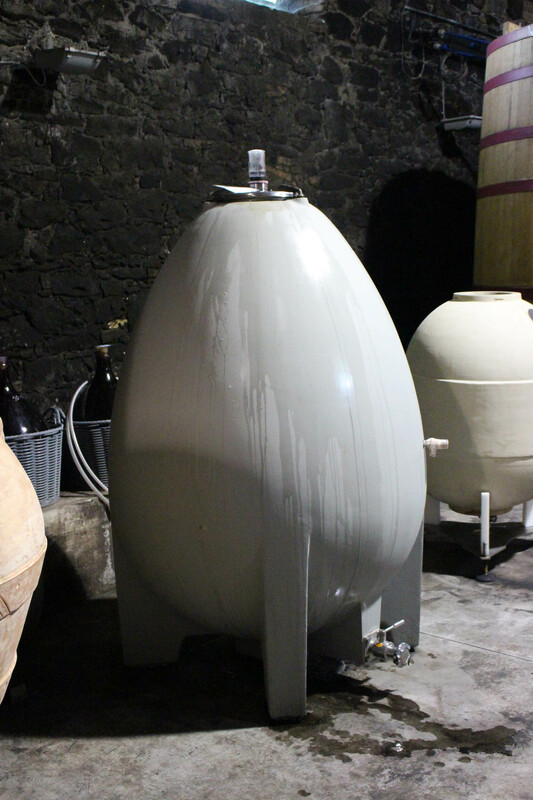 The maleolactic fermentation imparts a buttery quality to the wine. The use of barriques imparts a subtle oak feel reminiscent of French chardonnays. Nancy has shamed me into resuming my writing. To make sure I continue, I’m going to tell you what I’m planning next, just to keep me doing more writing and less drinking, the latter of which I think I’m much better at. In any case, next time we’re going to visit Puglia, one of the little known jewels of Italian winemaking. 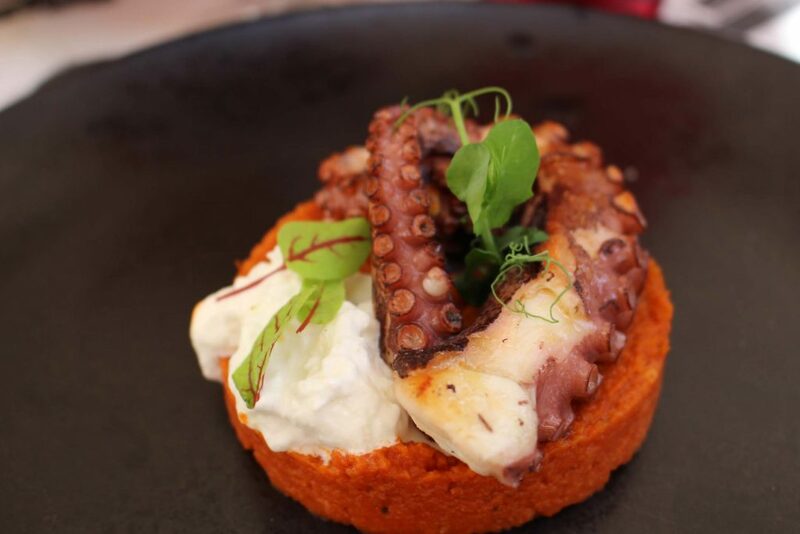 If you think Puglia is just a sort of Italian zinfandel, you’ve got a surprise coming. This entry was posted in Uncategorized, Wine and wineries on September 11, 2017 by Nancy Hampton. Every year we have meant to go to the Only Wine Festival in the town just north of us. This year we did. 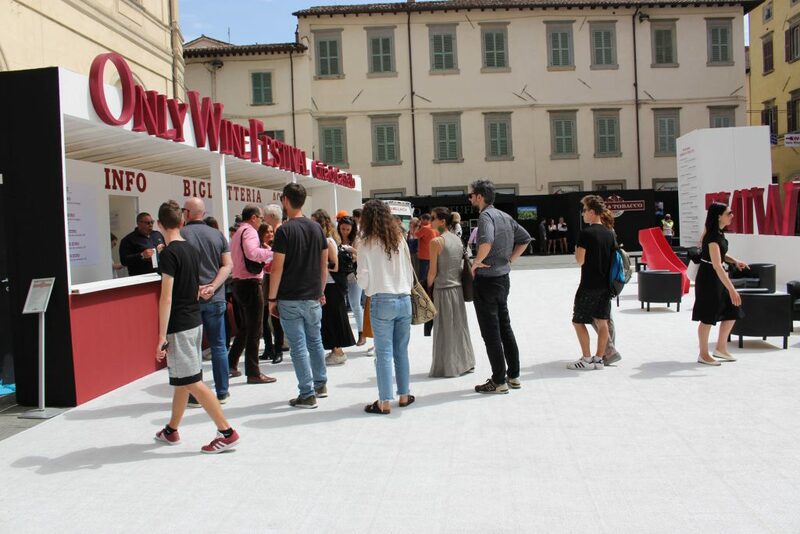 The purpose of the festival is to promote young winemakers around Italy. The winemakers must be under 40 years of age. It helps them get publicity and visibility they may not have gotten elsewhere. The festival has a website and we checked it out. 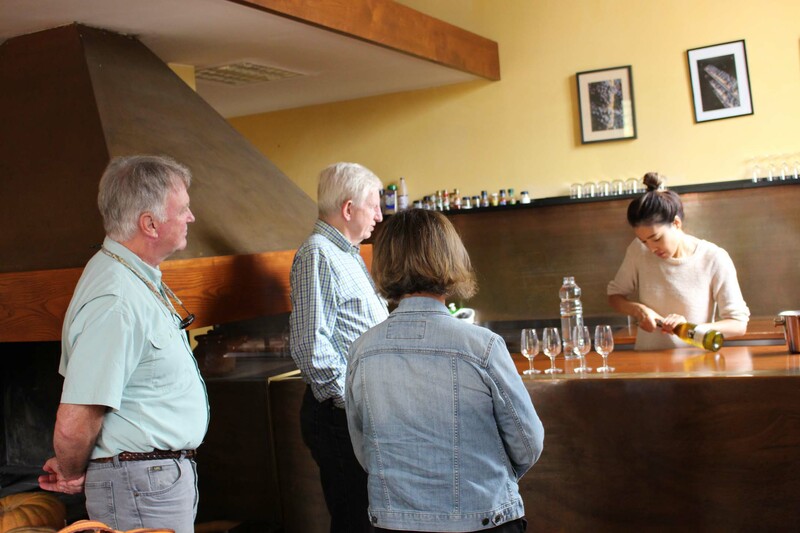 There were many special tastings such as a Whisky tasting, Sparkling wine tasting, Cigar tasting, beer tastings, regional wines such as Umbrian, Tuscan. These had to be reserved and had a fee. 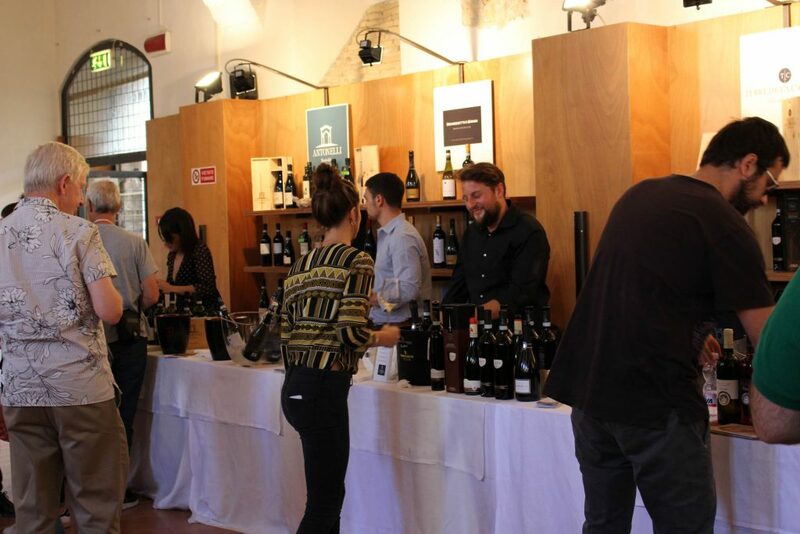 We decided to go for a targeted wine tasting of wines grown in volcanic soils around Italy. We really didn’t know what to expect so this was an exploratory mission. We arrived around 5:15 and our tasting was at 6PM. This left time to do some of the regular tastings. There were many different venues. There also were two full floors of a palazzo that had numerous wine stations for tastings. 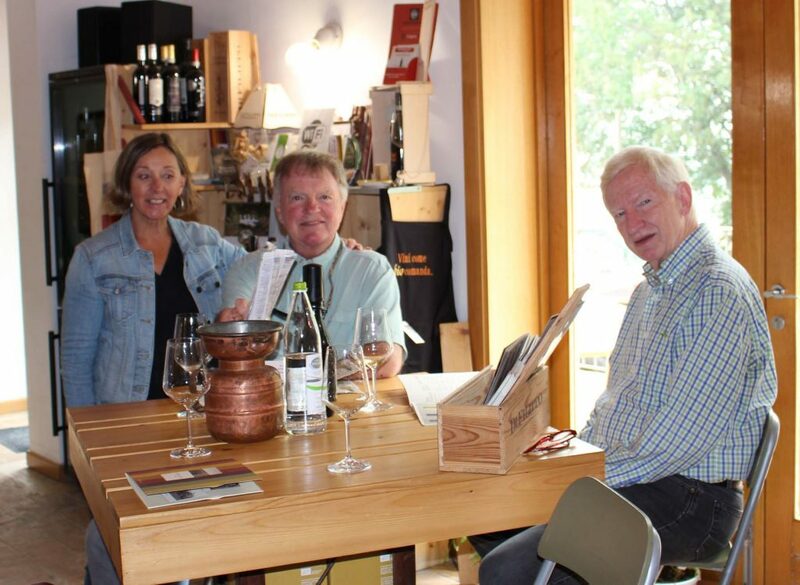 Ostensibly you paid 15 Euro and that entitled you to five “Free” tastings of the wines. Only in Italy would they say you were getting free tastings but you had to pay the 15 Euro for them. Anyway, since we were going to the Volcano tasting we decided to just get one “Free” tasting for the 15 Euro and we’d share it. They give you a nice glass with a little sack you put around your neck to hold the glass and five tickets for the tastings. Turns out no one takes your tickets so you go in and it’s unlimited tastings for as long as you can stand up! It wasn’t too crowded because it was early. 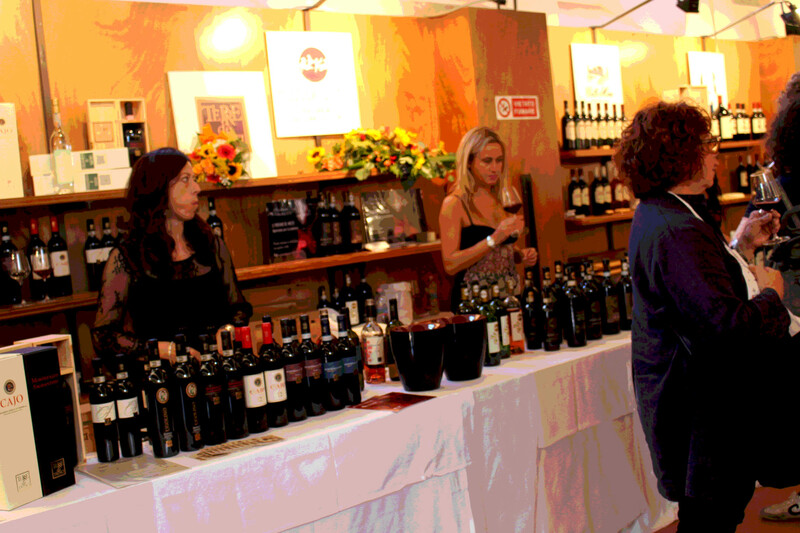 We enjoyed all the young winemakers who were eager to talk about their wines. The sun was setting when we left and walked through this park to our car park. Beautiful! We will go back next year but this time we’ll stick to the regular “Free” tastings. 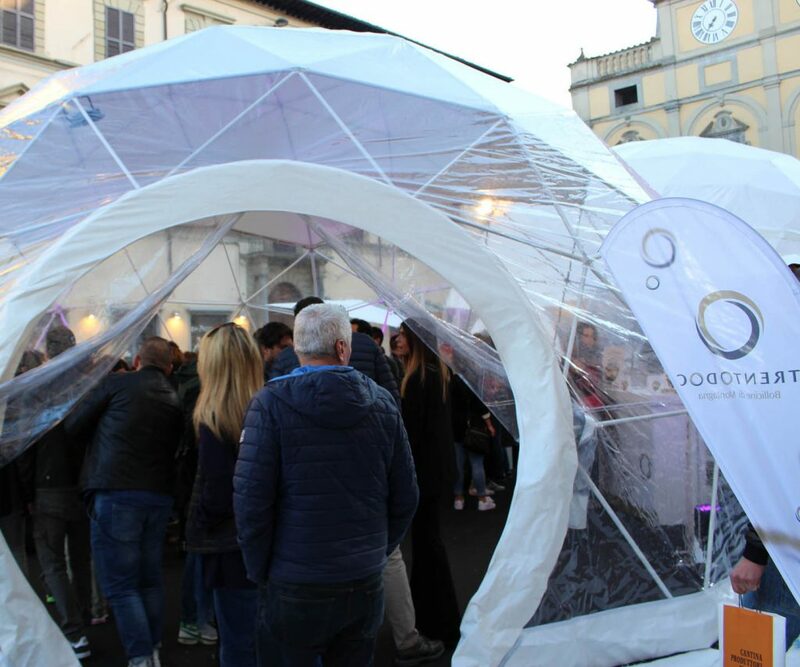 This entry was posted in everyday life in Umbria, Festivals and Sagras, Umbria, Uncategorized, Wine and wineries on April 23, 2017 by Nancy Hampton. 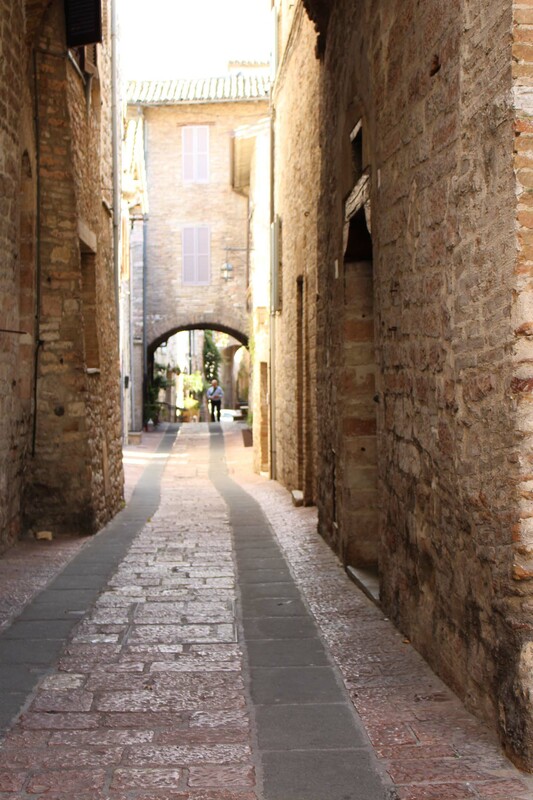 We are just back from a fun quick trip to Montalcino in Toscana. 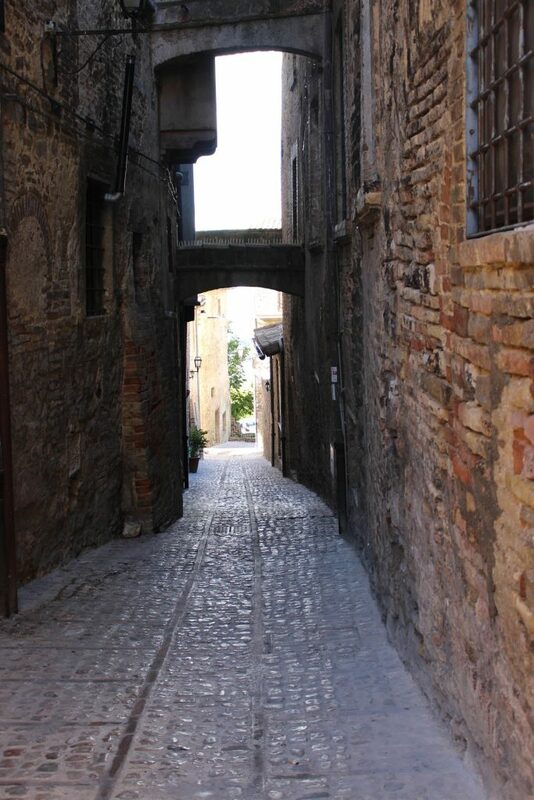 This town/area is famous for the Brunello di Montalcino, a wine from just this small area of the world. And, of course, very famous and it draws many visitors. That said, the town of Montalcino was a nice hill-town. It had its share of tourists (mostly American) but seemed to have it’s own life and locals living their lives within the walls. I read a book called “Vanilla Beans and Brodo” about life in this town. Pretty good for Italy fans. We visited two wineries on the way. Little did we know almost all the wineries in this area are on White Roads. These are gravel roads that are not meant for a car like ours. We also should have called for appointments. The first one, Innocenti the person was not there until afternoon. But along this White Road I snapped some spectacular pictures. The day was just perfect. Look at that sky! We visited Sasso di Sole winery on the way back down the white road. Their wine was pretty good. We bought some. The nice woman there recommended a restaurant down the road a bit. 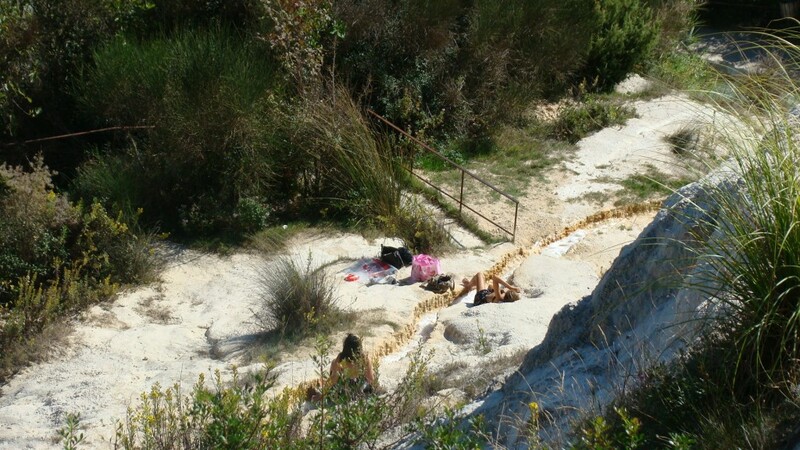 It was in a spa, or hot spring town called Bagno Vingnoni. It was lovely. The main part of the little town surrounds the walled in spring which is where the main, hot spring surges up from underground. You can see the bubbles roiling the water. Surrounding this area are restaurants and spa buildings. 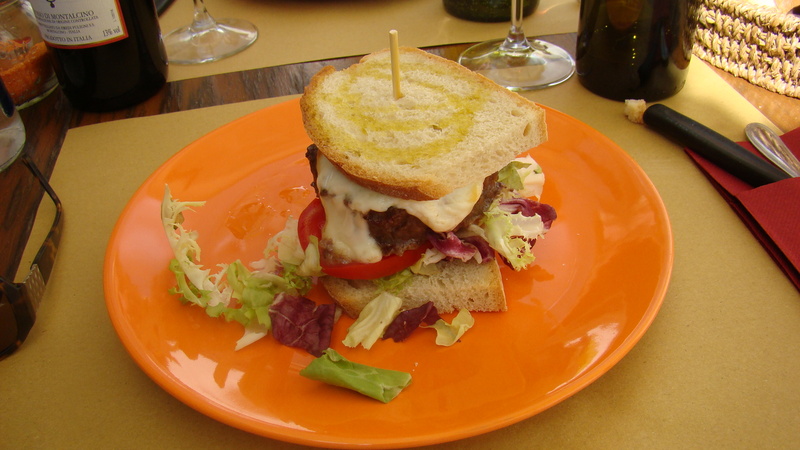 We visited Il Loggiato and had a very tasty hamburger of Chianina beef, the famous white cattle of Tuscany. Perfect lunch outside under blue skies. Nice. I would never have known to go here! Very below the radar. This is the penned up spring. Water really bubbles up from below. My burger. 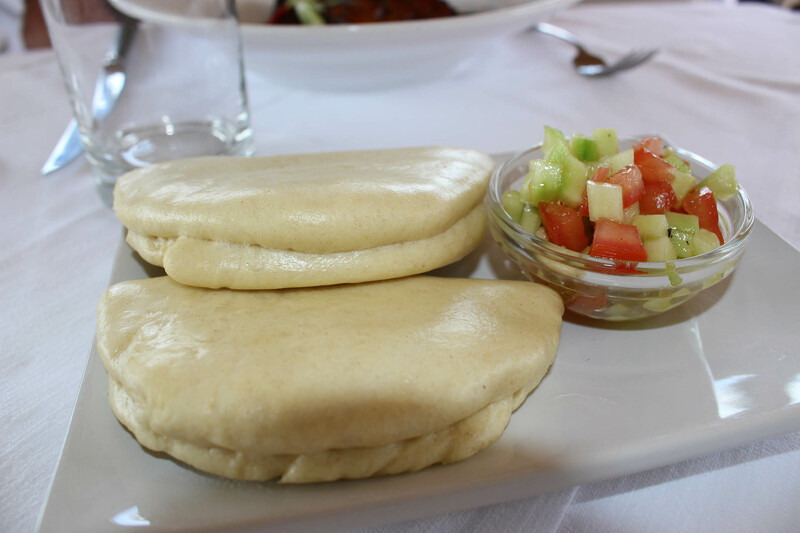 Unconventional bun with olive oil, But why not!? 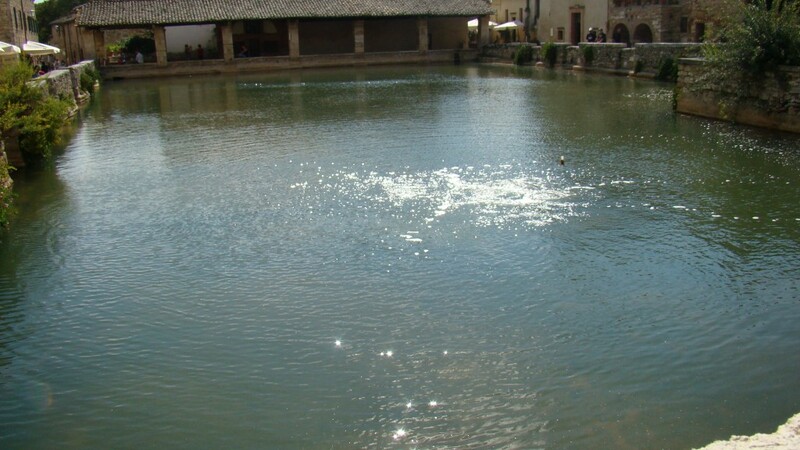 After the spring bubbles up it flows underground and out into spillways where people sun bathe and soak for free. Finally flows into this river. 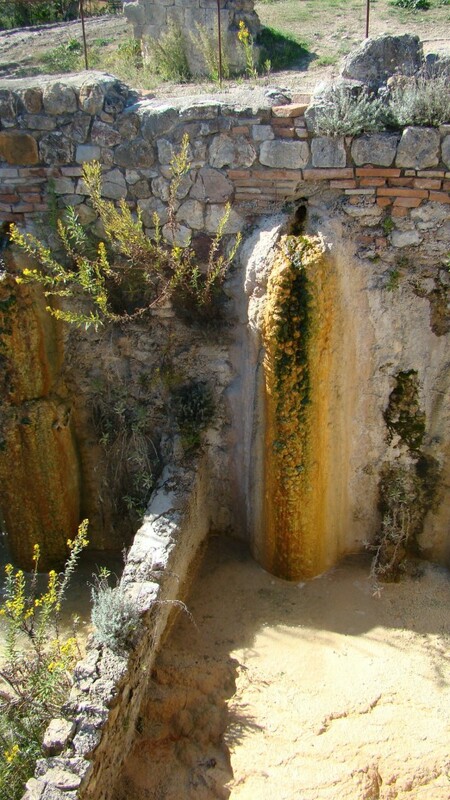 Water running down the wall for probably centuries has built up quite a mineral deposit. 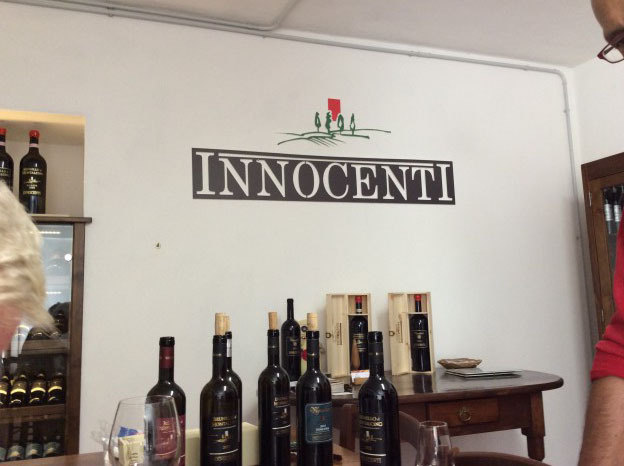 We returned to Innocenti and this time we got to try their wines. Nice man. I was amused by the fact that he asked us after the wine tasting if we wanted to taste the olive oil. I said I preferred Umbrian oil so no thank you. Well after we had purchased some wine he brought out a bottle of the oil and gave it to me as a “gift”. Ha. I guess he was miffed at my comment and was going to try to get me to change my mind about my preference. Sweet. 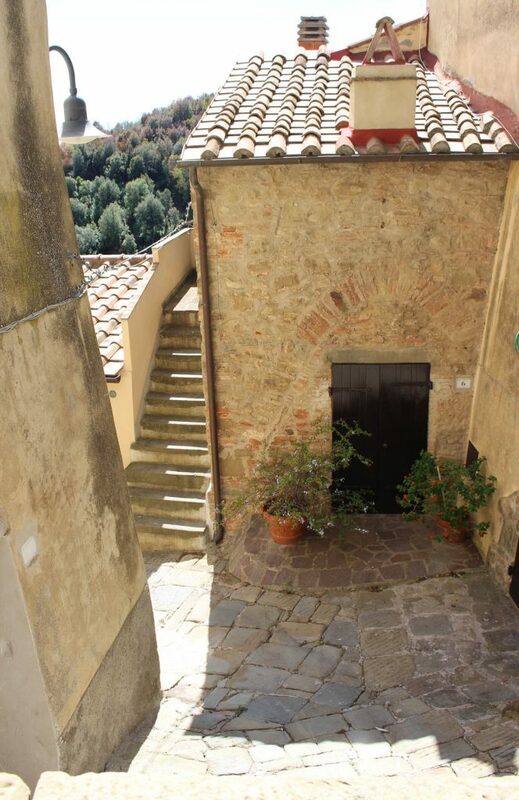 We arrived in Montalcino in late afternoon. We stayed in a hotel on the edge of town which advertised “free parking”. We drove the Porsche and when the proprietor saw it he said maybe we shouldn’t try to drive to his parking. Turns out the road had been badly washed out and a car like ours had a VERY hard time getting down it. We did but it was not pretty. We did drag the undercarriage a few times. 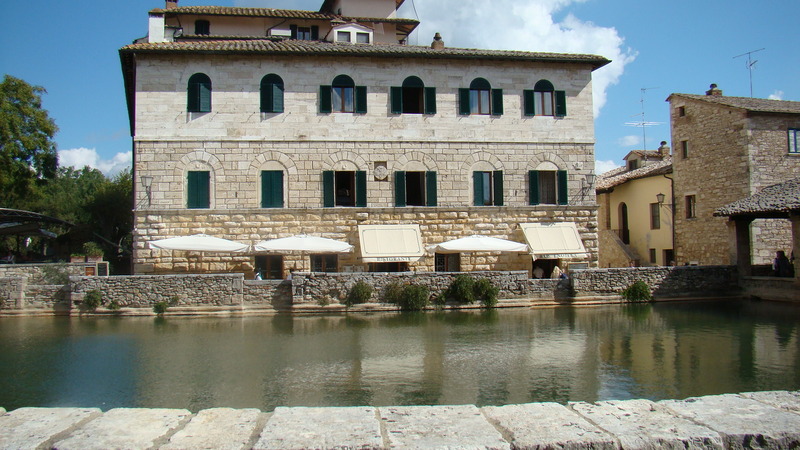 The hotel was quite nice called Vecchia Oliviera. The proprietor was nice. Rooms very spacious with really pretty views. Not many people were staying there. We could easily walk to everything in town. Misty morning view from our room. That evening we walked up into town to a restaurant called Drogheria Franci where we had a good meal which was not traditional Tuscan. A little more innovative than one would expect. The town of Montalcino is not very big but on a hill. At the top was the Fortress. We were near this. Next day we were off on quests for more wine. We were off on yet another White Road! After 3 or 4 kilometers we finally got there. This one was called Fattoi. A nice young girl gave us a tasting (it was 10 am!). We bought some wine and headed out to find more. 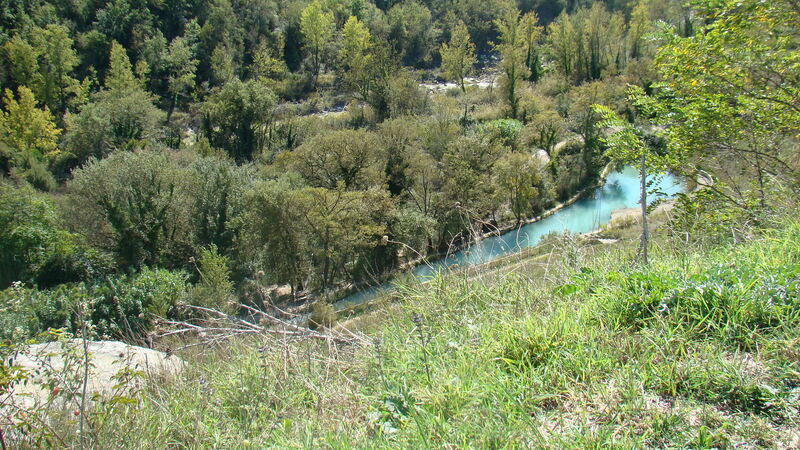 The countryside in this part of Tuscany is extremely diverse. It ranges from verdant wine areas to barren wasteland. I do not know why this is. We were unsuccessful in finding our next winery. It seemed to be on a White Road that was impassable without a 4 wheel drive. Resigned, we returned to Montalcino. 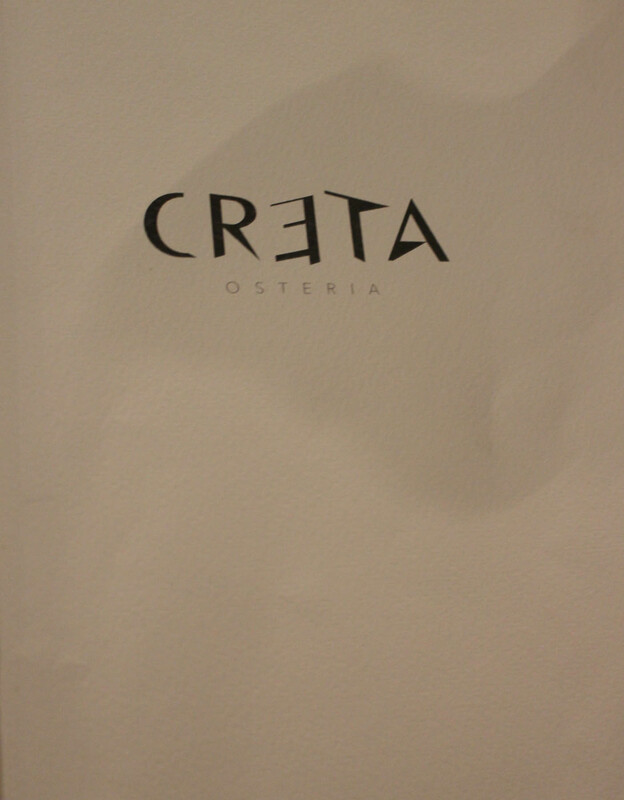 We visited an enoteca which was also a restaurant. It filled up quickly and I only heard American voices. The lunch was quite good and the views were killer across the valley. Back to our room for a nap. That evening we had reservations at Osteria di Porta al Cassero. It was up near the Fortress. Food more traditional Tuscan. Very nice place. All in all a nice getaway. I am a little tired of traveling and am looking forward to staying home for a couple of weeks. This entry was posted in Eating, restaurants, Travel, Trip Report, Uncategorized, Wine and wineries on October 9, 2016 by Nancy Hampton. Nancy Hampton on Puppy rescue! Mary Rodriguez on Puppy rescue!